If you hit the trail early enough, you're likely to encounter deer and more than a few chipmunks. Once the sun gets high, watch out for the occasional snake sunning itself on the warm pathway. A few interpretive signs along sections of the trail provide information about the mining towns, as well as some of the historical features. Mining slag and old railroad ties can be found at numerous points along the trail. 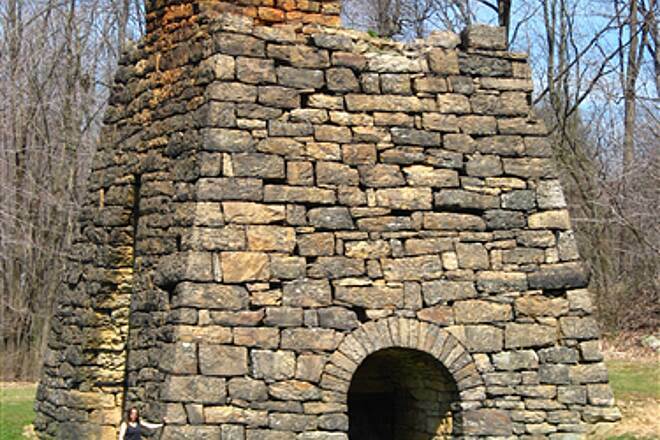 Just west of Vintondale, you come to Eliza Furnace, on the National Register of Historic Places and one of Pennsylvania's best preserved iron blast furnaces. As of September 2017, another 8 miles has been added to the Ghost Town trail system. The extension, known as Stritty's Way begins at the end of the Rexis Branch Spur, past Belsano Crossing to North St. in Cardiff and occupies the former railbed of the Cambria and Indiana Railroad. 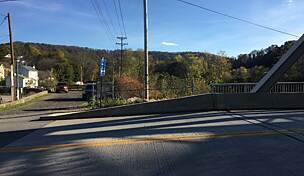 On the eastern end of the trail, you can reach the Ebensburg trailhead from Altoona by taking Route 22 west to Ebensburg and then turning right (north) onto South Center Street. The street snakes left and then right. Before it veers right, you will see the trailhead and parking straight ahead. 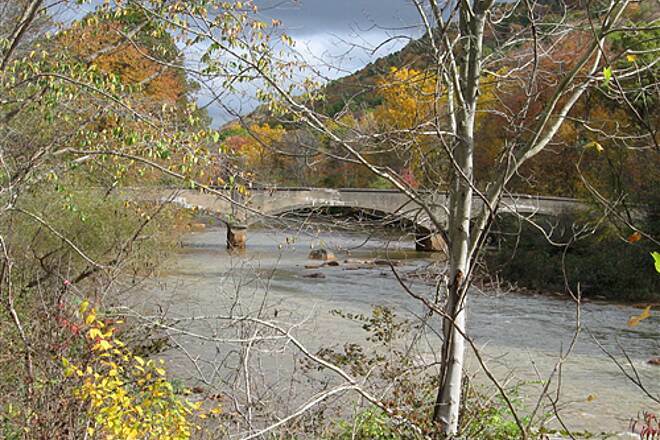 On the western end of the trail, ample parking is available at Saylor Park (1284 Old Indiana Road) in Blairsville. Rode this from Saylor Park to Nanty Glo and back. The uphill grade from Vintondale to Nanty Glo is challenging at times for the mediocre rider and the weekend warrior. It's not a bad trail. Smooth, compact gravel makes it perfect for any type of bike. 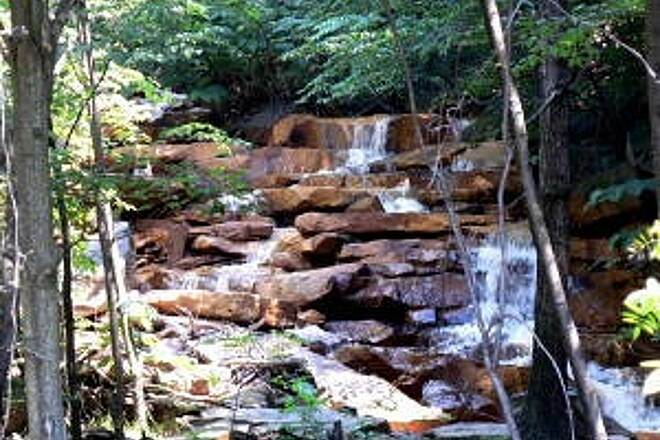 If you grew up around the mining industry, this trail offers very little scenery. If that history interests you, you may find this trail more interesting. 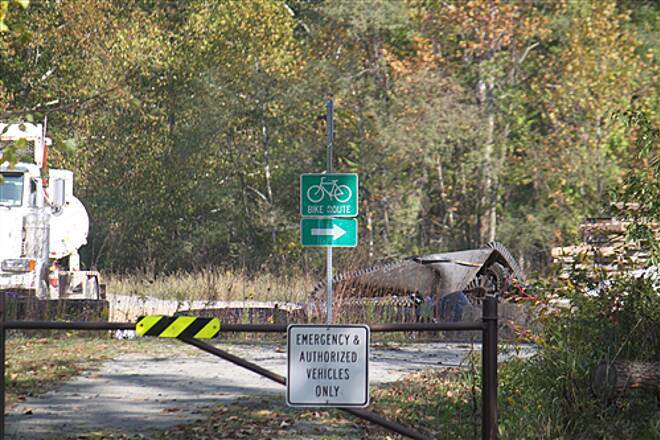 Signs along the trail and the orange-red creek provide the backdrop of an industry long gone. The trail heads offer rest stops and restrooms but between Saylor Park and Nanty Glo there's nothing as far as convenience stores in the little villages along the trail. Rode sections from Nanty Glo to Ebensburg and Heshbon past Dilltown. Great trai with a number of interesting signs on the mining in the area and the status of the river. The trail is pretty well supplied with benches, has a few potties, and the two new bridges are charming and fun to ride across. Dilltown is a nice oasis, with covered tables, potties, and a store. This is a great trail. Largely flat is very clean. I only did 6 miles. Bring your own water and do a potty break before you start. This is a beautiful trail. Please be aware there aren't port-a-potty's along the trail. If you need a bathroom, you'll have to go into a town and find a business or go in the woods. We started in Ebensburg, rode 10 miles then turned around and rode back to Ebensburg and only saw one portapotty next to the ball fields in Nanty-Glo. We also heard there were big hills. We felt it is definitely an uphill grade but it is do-able. Other than that, it's a beautiful ride. It reminds me of Ohiopyle area/GAP Trail. My wife and I have done all sections of the trail a number of times. 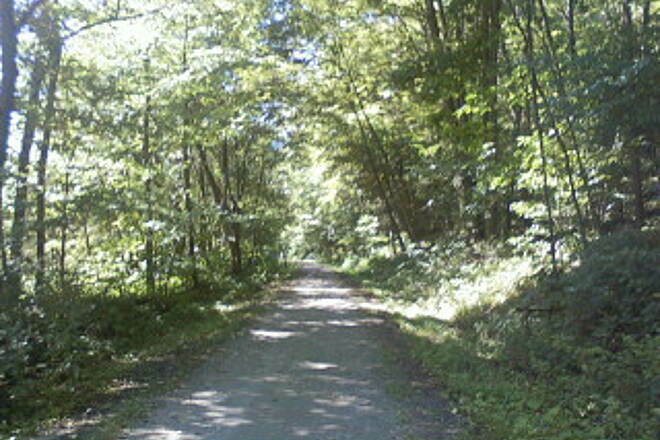 The trail is very well-maintained and is mostly shaded. 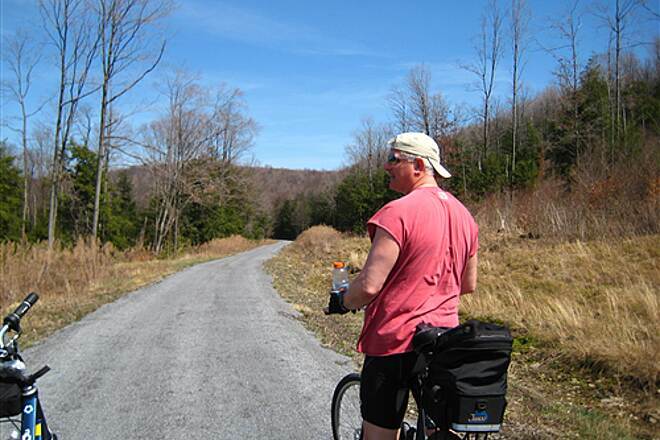 As other reviews indicate, if you travel from Saylor Park to Ebensburg (West to East), the sections of Saylor Park to Heshbon, and Vintondale to Ebensburg are definitely up hill, but my wife and I have completed both and we're retired and have only been bicycling about a year. When we ride the trail we always see families with young children pedaling in both directions, so the grade can't be that bad. Don't let the "up hill" scare you off. My observation is that most reviews describe steep climbs that are only exist in the mind of the bicyclist. Besides, any up hill climb going out creates a fantastic trip back. Try it, if it gets to steep, you can always turn around. If your looking for a flat ride, the section between Heshbon (Rte 259) and Vintondale will be perfect. Both Heshbon and Vintondale have a restroom and pavilion. In the middle of that section is the Dilltown Trailhead. There you will find a restroom, a pavilion and the Dillwood B&B. The B&B has a little store that serves snacks. We suggest the gobs. If you make it to Nanty Glo, you must stop at Al's pizza. Not only do they serve pizza, but they make the best home-made pies; coconut creme seems to be their #1 seller. As you can tell from our reference to gobs and coconut creme pie, we're not that athletic. As we climb the hill to Nanty Glo, our mantra is "Pedal for the Pie". We highly recommend this trail to anyone. Traveling the Ghost Town Trail this Sunday July 3, was somewhat of a homecoming for me. 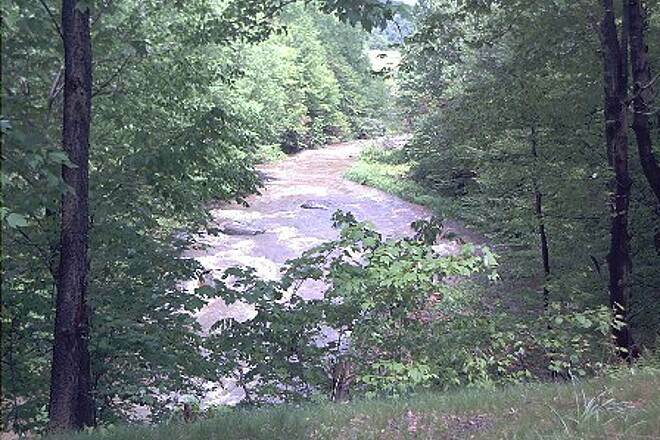 I grew up in the area and deer hunted in this valley during the '70s. 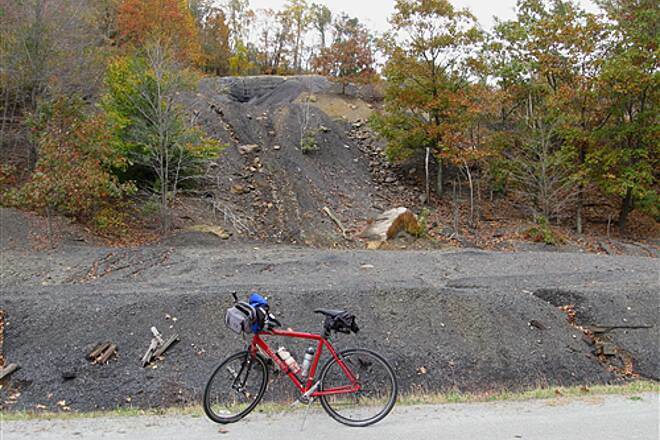 I remember watching the coal trains pass by on the very trail that I now enjoy bike riding. We rode west from Dilltown and went passed the ghosts towns of Scott Glen and Claghorn. I know about the fascinating history of these ghost towns and tried to visualize what life must have been like during that era. The scenery was terrific! We even watched an Amish man and his son fishing along Brush Creek. Great homecoming, great trail! This trail is very well maintain. Some lose gravel is spots. Signage and bathrooms are well placed on the western half of the trail. The eastern half has a steeper climb and no bathroom and less signage. We started at the Heshbon access point and rode to Vitondale. It is a beautiful crushed limestone trail. Very well maintained. 1st couple miles from Heshbon has a lot of milkweed just starting to bloom and thus there were lots of butterflies! The stream that runs along the trail is beautiful too and adds to the experience. Dillstown has a very nice restroom and covered picnic benches. Also, in Dillstown there is a store that sells some snacks and drinks (along with unique gifts). But we didn't find any restaurants in the towns we biked through, so if you are going for a long ride, make sure to pack a lunch or lots of snacks! Good ride, even with rain at the end! We started at the westernmost end of the trail and rode 10 miles east until reaching Route 56, then turned back. Therefore, I can't speak for the entirety of the trail. There's a mostly-imperceptible uphill heading from west-to-east, which makes the east-to-west return a pleasant downhill ride. The trail is well maintained. Trees provide shade for a lot of the trail, with occasional areas of no cover. 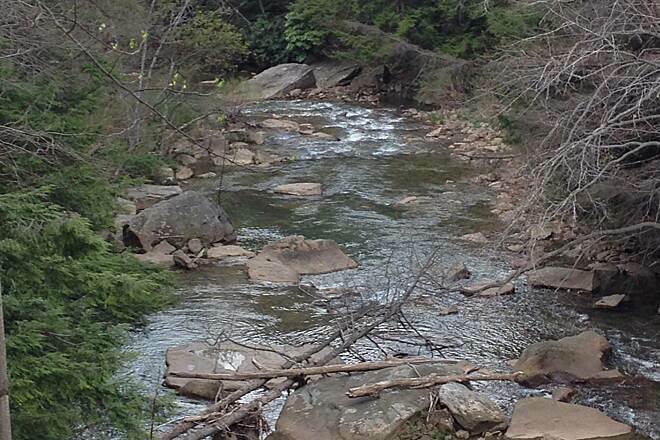 There is a creek that runs along the side of the trail which is very pretty. There are a number of historical landmarks along the trail, however in less quantity than I expected. At the easternmost end of the trail, there is a latrine in the park - try to avoid having to use this, as it was rather unpleasant when I was there. There is a latrine and a gazebo around mile 6.5 heading east, and I would recommend taking advantage of these. Make sure to bring water though or fill up at Saylor park, as there are not fountains along the trail, at least for the westernmost 10 miles. Overall it is a very nice trail and I found it very enjoyable. I look forward to exploring the rest of the trail. I have ridden this trail before and enjoyed the ride and history of the area, however I broke the bolt that held the saddle to the bike and was distracted the last 10 or so miles. This time I rode 50 miles or so by starting in Dilltown and heading to the terminus of both legs of the trail to the east. 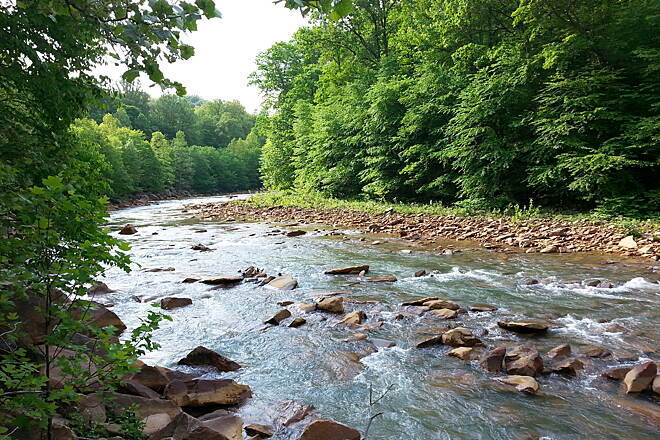 The scenery was better than I recalled with lots of wooded river side runs and shade. The trail rises to the east, so climbing on the way out was rewarded by a downhill slope on the return. Dilltown is particularly a nice place to start the ride with restroom and picnic facilities, a trail shop with ice cream and drinks across the street and COMPRESSED AIR station to top off the tires. 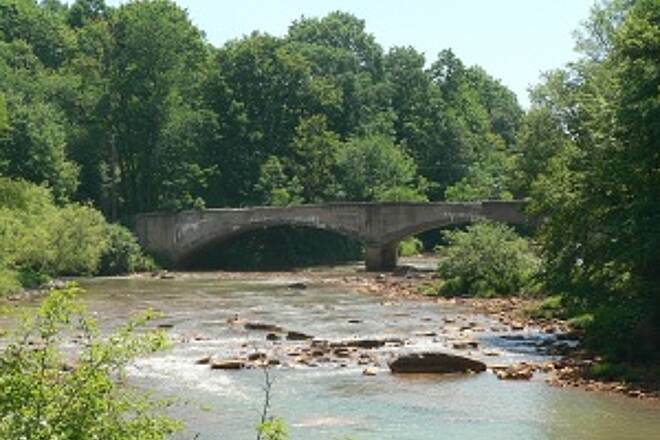 Travel 2 miles west and see some nice bridges and natural stone formations as well. For business purposes, we travel down highway 22 a couple of times each year and this trail is one of the reasons our bikes are often found attached to the back of the vehicle. We have now ridden the eastern and western sections of the trail and love it. 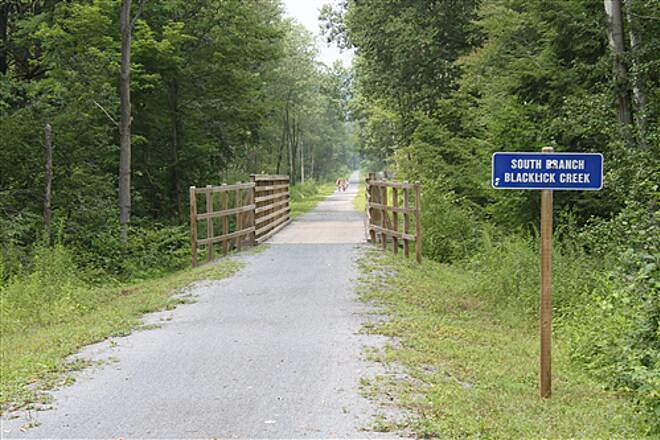 The stretch from Black Lick to Dilltown is mostly a rural environment and for the most part runs along Black Lick Creek. It is filled with remnants of the past so be sure to set aside some additional time to take in the sights. 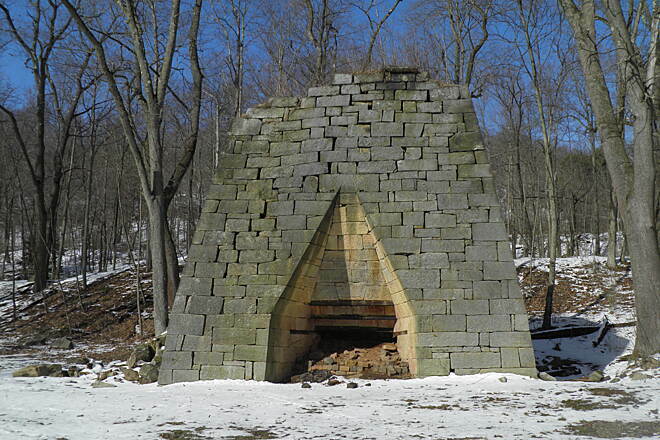 The part of the trail from Vintondale to Ebensburg (our latest ride) is rural as well and we found the monuments at Vintondale to be particularly interesting. 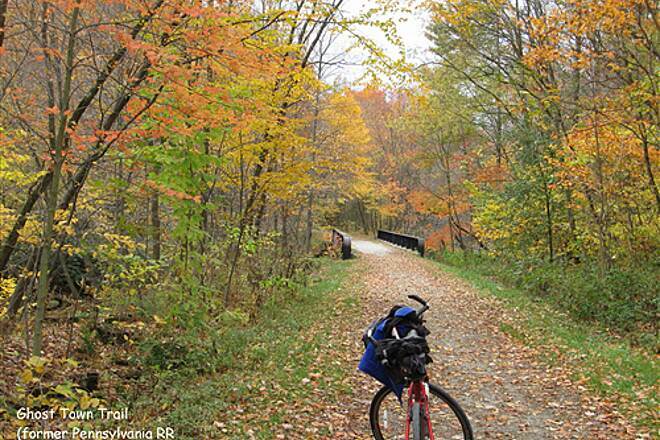 It is noted that typically rail trails have a 10 to 15 feet per mile elevation change. According to our gps, we climbed over 600 feet on our last ride. This is 3 or 4 times the usual amount and it was definitely noticeable. Mother Nature was smiling on us though as the day was overcast and a little on the cool side so we were able to make it up and back on one water bottle each. On a warmer day we would probably need to take on additional water at Ebensburg. It is already marked on our schedule to return next summer to finish the trail. Rode this trail by myself May 13th. It was 54 degrees and breezy. Didn't care, it was a beautiful day of cycling. The scenery was great! Waterfalls, abandoned rail cars, the river, wild mountain laurel smells were breath-taking, saw deer, the old furnaces..... What more can I say? The 3% grade I absolutely loved, a great leg workout. I rode from Grafton to Ebensburg, so if you don't want the grade I recommend riding it the other way East to West. There are 2 more trails going off of this one. So, I'll be going back for the weekend and doing all 3. I like to ride the trails from end to end and back. But, loved it, and definitely going back with friends. And also I stopped and ate at the Dillweed Bed & Breakfast in Dilltown. The food was great and the best whoopie- pie I ever had! i parked at the Nanty Glo location and ran east towards Ebensburg. Fairly flat even though my running app showed elevation levels between 1671 ft and 1856 ft. I ran by the 7,6 and 5 mile markers. Starting in 1994 our family has done a bike ride together every other year in various locations. 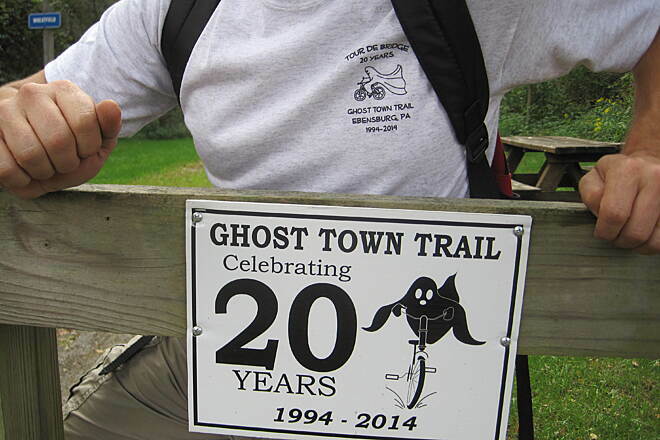 Our 2014 ride on the Ghost Town Trail marked the 20 year anniversary and our 11th ride together. We started near my parents' home in Ebensburg and biked one way to Dilltown. Even following a mid-morning shower, the trail was in excellent condition. Our family group of 19 riders spanned from 7 to 57 years old and included a hand pedaler and a pregnant woman. 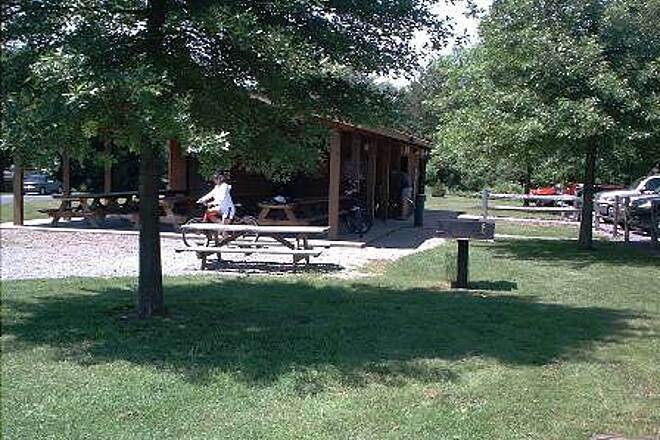 Our sag wagon met us at several of the crossings, and delivered lunch to the pavilion at the Dilltown trailhead. After lunch we biked past Dilltown to see the bridges, logging about 20 miles total. 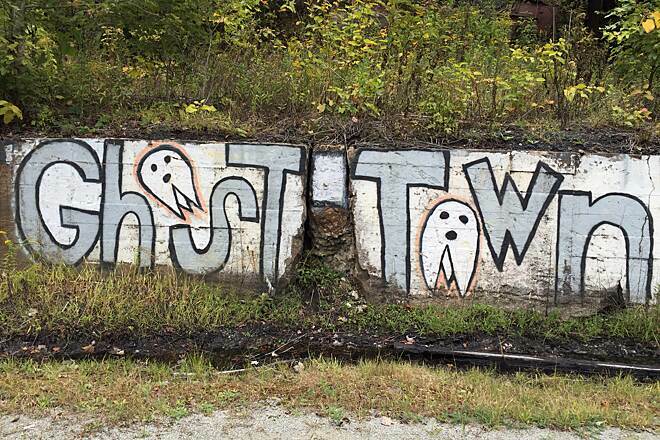 We were surprised to learn that 2014 was also the 20 year anniversary of the Ghost Town Trail. Just a little spooky. If you are riding with your older brother, I suggest you beware of people jumping out from behind trees and shouting "Boo!" Other than that, a peaceful ride on a beautiful trail. Ghost Town Trail...END to END! 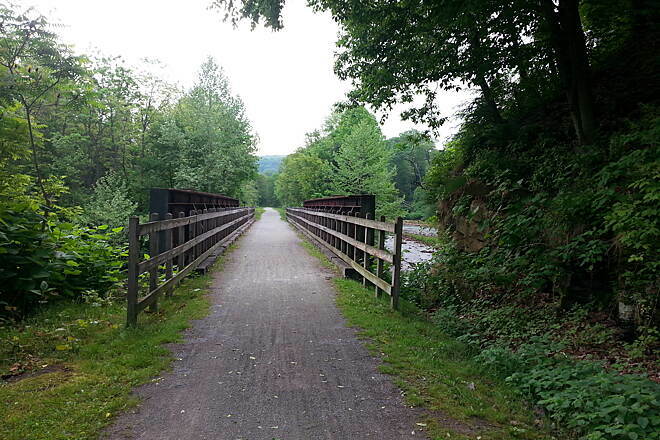 My husband and I biked the trail from Saylor Park to Ebensburg. We spent the night in Ebensburg at the Noon Collins Inn (Awesome Place!) and then returned home via the trail the next day. We had never been on this trail before and I'm so glad that we made this trip. It is full of history, which made it fun to stop and check things out along the way. Sometimes it was an informational sign or a huge historical landmark. The trail was well-maintained and easy to pedal. Our only complaint (and really just a warning) the section of trail near Nanty Glo and Ebensburg was a steep grade. After biking the whole trail, we struggled to keep going. It was tough. If your not going to go back and forth (but want to bike the entire trail), I would recommend starting in Ebensburg and ending in Saylor Park. It was much easier on our return trip. It was a trip we will always remember! 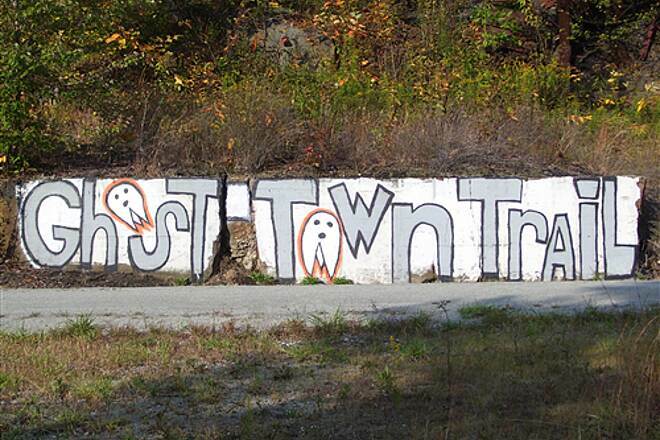 Consider making memories with your friends or family on the historical Ghost Town Trail! Beautiful ride. Started in Saylor Park in Blairsville toward Dilltown. Cute little bed and breakfast in Dilltown with picnic grove and place to get a sandwich and snacks. Trail runs along creek with gorgeous views of the area. Loved it and will definitely go back to continue the great ride. 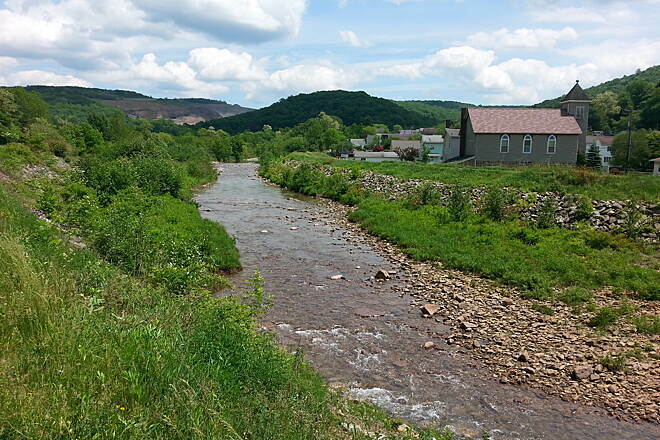 We spent two days traveling from Dilltown east to Ebensburg and west to Saylor park. 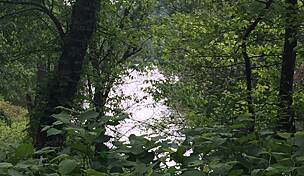 We saw one Orb and one fellow dressed like Natty Bumpo fishing in Blacklick Creek. Since the creek has been dead for 100 years we couldn't believe he would catch anything. 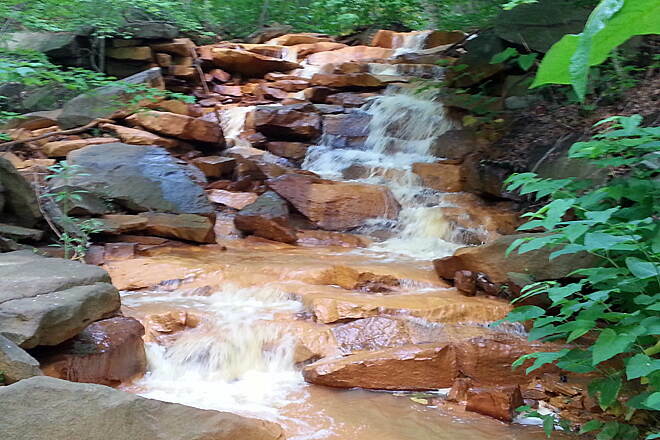 The trail is great but FDR's uncle ruined the creek with his mining over 100 years ago. This is a nice trail and well maintained. Maybe the fisherman was a ghost but with the condition of the water he probably soon passed on. I really do not know what they could do with cleaning this stream. They are trying but it looks like a hopeless cause. The only drawback is the stream and the GOB Piles from the coal industry. 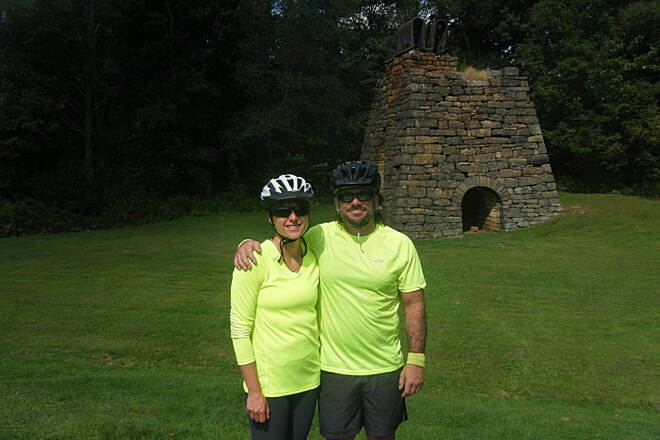 My wife and I on our 40th anniversary had a wonderful weekend on two rail trails. We did the Ghost Town Trail from just W of Dilltown to the E terminus at Ebensburg and back. Going E first puts allows a downhill return trip, a good idea as this trail has a significant slope (for a rail trail), especially just W of Nanty Glo. Lots of shade, mining/smelting history, good surface throughout. We stayed at the Noon-Collins B&B in Ebensburg the night before; highly recommended and a great value in an unusual setting for a B&B. The proprietors, Lew and Jeannette Ripley, were friendly and accommodating. Next day we did the Lower Trail, which is scenic (runs along a branch of the Juniata R.), nearly flat, and has much bird life. The two rides made great weekend. With a perfect day on tap, the Mrs. and I headed out to the trailhead in Vintondale with the bikes loaded up in the truck. We started off riding the spur trail that heads due north up to rt.422. It's uphill out of Vintondale. Good workout if you're looking for one. 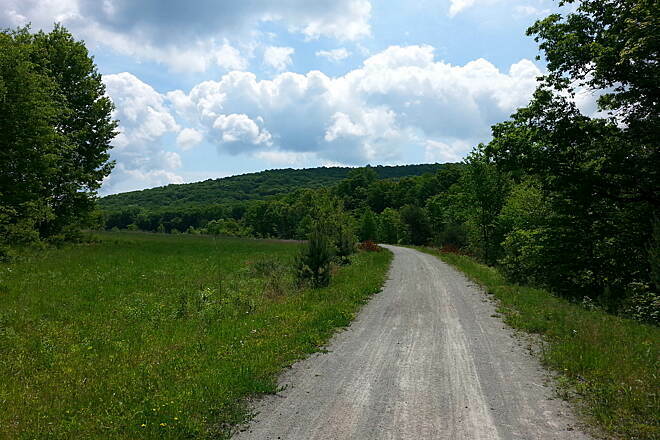 We rode back to Vintondale and headed up the hill to Ebensburg and the eastern terminus of the trail. 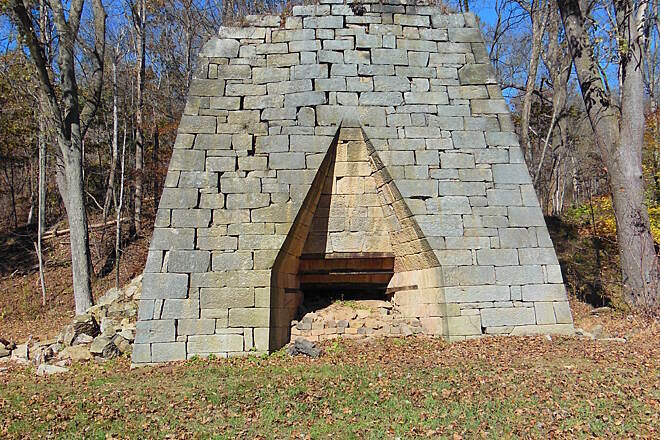 Right at Vintondale you have the Eliza Furnace. Heading up the spur there were evidence strewn about that the beavers have indeed, been busy, not to mention some abandoned mine equipment. Heading towards Ebensburg, especially around Nanty Glo there are some enormous spoil piles from the mines as well as an abandoned abutment from a line that look like it went back into the mines. The ride up to Ebensburg is all uphill as well and another good workout. 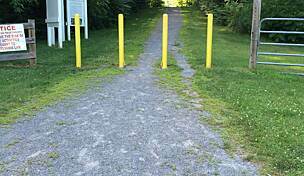 When you get to the Ebensburg parking lot you may thing you've reached the end of the trail, but you're really about 1/2 mile from it. The trail terminates at a road crossing and across the road you can still tracks leading off into the brush. The ride back is downhill, fast, and easy. Saw a baby snake as the trail surface was probably warming up fast in the sun. Little guy was only about 18" long and moved too fast for me to really ID it. Todays ride was the last section of the trail for us to ride. Now we just have to do one direction from end to end! Great trail, smooth ride, get out and enjoy! information. And I’m sure it is well-worth reading. Walking or bicycling this trail is one of the most relaxing and peaceful outings that you and your family can enjoy without bankrupting yourselves. Personally, I find it more relaxing than the beach, and more refreshing than golf, tennis or shooting pool. And as we walk, my wife and I have re-discovered good-old-fashion conversation. I could talk on and on but that would give away the nice discoveries that lay with this trail, for there are many interesting and historical encounters that’s met along the way. It’s called the Ghost Town trail but I never encountered any ghosts, but if one is hanging around and a chance comes to talk with him-- do it! 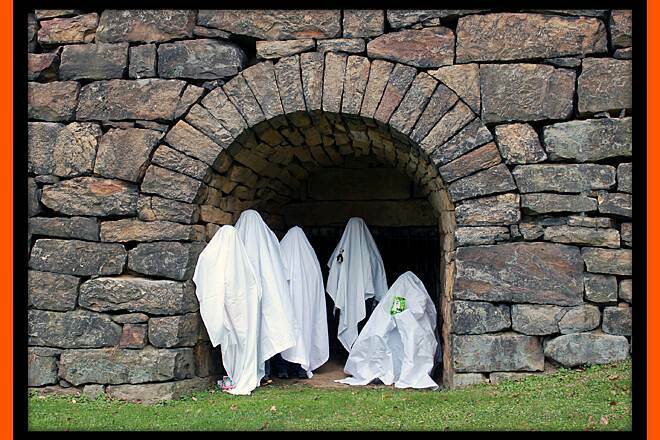 I’m sure the ghost will keep you captivated with stories from the many years of the by-gone era! The Mrs and I rode 8 miles from the western terminus at Saylor Park in Blacklick to Claghorn yesterday. We would have probably ridden another mile or two in, but the squall line approaching made it clear to me it was time to turn and head back. The trail surface is excellent. There are some wrecked rail cars and such just as you get started on the trail out of Saylor Park and if you keep an eye on the creek, you can see things like old bridge pilings, and the remnants of a low dam. 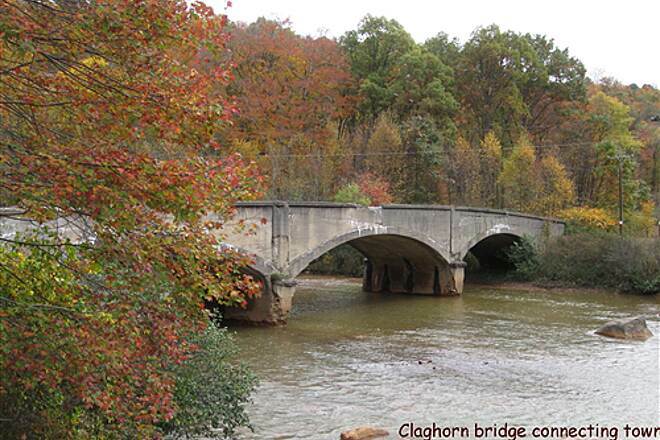 There's also an old abandoned bridge right where Claghorn used to be. 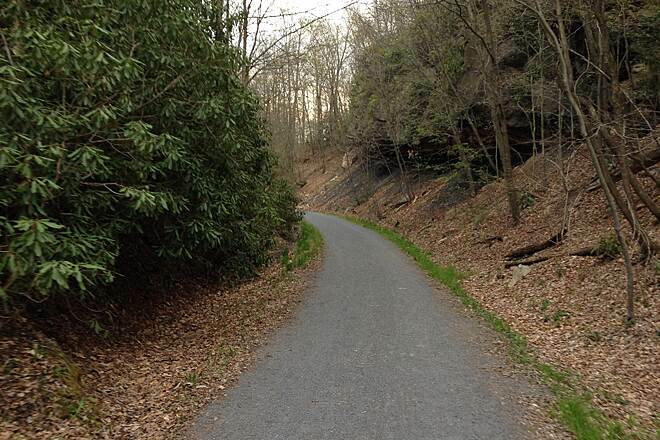 You'll also pass the remnants of a coal tipple about 6 or 7 miles in. While it was cloudy for us, there's a goodly amount of tree cover for summer rides. It's a slight ascent out of Saylor park, but the gradient is very mild and barely noticeable. Just enough to make you appreciate it on the ride back to the parking lot. 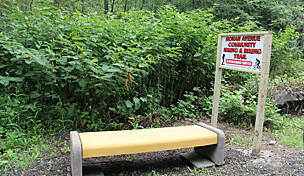 There are benches periodically along the trail as well as facilities at the park and just east of the Rt 259 crossing. We hope to ride more of this trail in the not too distant future! Enjoy the ride! I grew up near this trail, and for a good number of years, lived less than a mile from it. Its a great trail. Just recently I returned home to visit family and took my bike along for ride. It wasnt just nostalgic. Its still a great trail. I had been riding mostly paved rail trails recently but the crushed cinder tail was just fine and didn't bother me at all. If you have the chance, you wont regret giving this trail a ride. 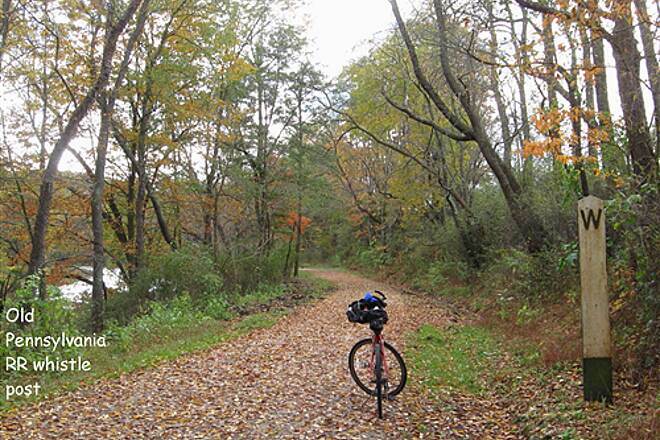 Yesterday, Oct. 2, 2013, I biked from Saylor Park for 12 miles out and back and loved every minute. I was surprised to read in the Tribune Review today (page B-9) that background radiation for sediment in Black Lick Creek is 200 times normal due to the discharge of treated water used in fracking. I think this might be important information to post on the Traillink website and I think that Black Lick, which is ideal for wading on a hot day, should be posted with signs warning of the danger. 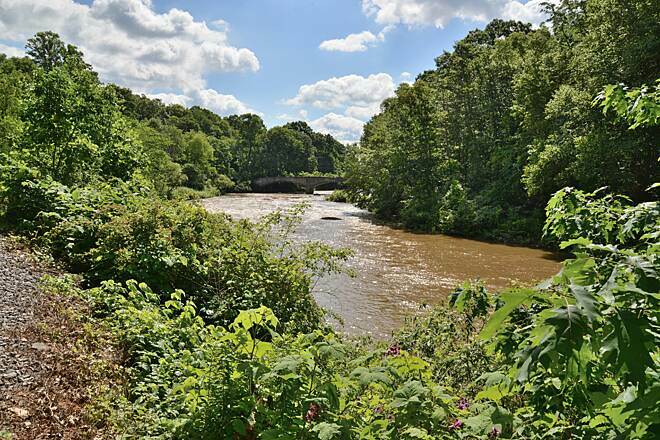 It was not reassuring to read "Black Lick Creek's radioactive sediment, while above acceptable levels, posed no immediate threat to people passing by." (B-9) Mike Finnegan, Esq. I could not have been more pleased with our stay at the Noon-Collins B&B. We biked the 32+ mile Ghost Town Trail from Saylor Park in Black Lick to Ebensburg. From check-in to check-out, Lew & Jeannette (the owners of Noon-Collins), could not have been any more attentive. They really cater to the needs of bicyclists. The Inn itself is a real treasure with antiques throughout and with real historic character and charm. The rooms are extremely cozy and comfortable. I stayed in the 'Green Room' which had a nice bed, comfy rocking chair, great shower and was loaded with toiletries, which is great for bikers. The town of Ebensburg is friendly and very pleasant. The stay was capped off with an incredible breakfast the following morning, which included a large bowl of fresh fruit, homemade strawberry/blueberry pancakes with syrup made with fresh blueberries! This B & B is a must visit for anyone, but especially for bikers traveling the Ghost Town Trail. A whole string of ex-PRR mileposts remains in place between Dilltown and Vintondale, then it quits entirely from Vintondale to Nanty Glo. Specifically, cast iron mile markers with raised numerals on rusty posts remain at MP 30 (0.2mi. east of the Dilltown trailhead), then at MP29, 28, and 26. Also note the classic cast iron ex-PRR point-topped whistleposts right near the Mile 30 marker, and 0.5 mi. east of MP 30. The Rexis Branch junction is located 0.2 miles west of the Eliza Furnace. We'll report on that 4-mile branch at a later date. Eliza Furnace is neat! 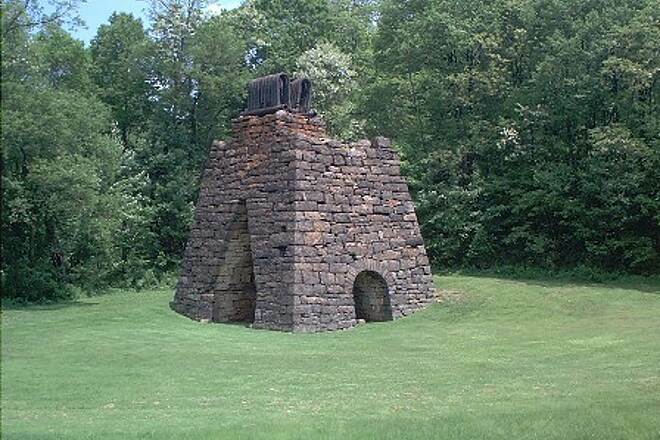 This iron furnace was in operation from only 1846-1849, but it still today sports its very unique steel "superheating" coils atop the furnace, and its iron was wagon-shipped to Nineveh, then west to Pittsburgh on the Pennsylvania Main Line Canal! (The railroad didn't exist until a half-century later!) Now the real challenge of this trail is that climb from Vintondale to Belsano and Nanty Glo. It's a tough. long 2-1/2 mile climb up a steep (3 to 4%?) grade, but the ride back down the hill is a real treat, coasting at a constant 10 to 12mph! There are some very interesting displays around Vintondale, too. Coal was first shipped out on this Cambria & Clearfield Railroad in 1894, and the last mine closed here in 1968. The Johnstown Flood of 1977 took care of the rest of everything on this line. Now I am VERY sad to report the closing 3-1/2 years ago of that wonderful NINER DINER at the trail crossing in Nanty Glo. The back ends of the '57 and '56 Chevys made into seats, and the now just memories of the great breakfast I had here 6 years ago was a real disappointment this time (I had planned on a nice supper there). But go right up the main street a couple of blocks, and enjoy a couple of slices of Al's Pizza. They open at 11am. Some real nice guys in there. 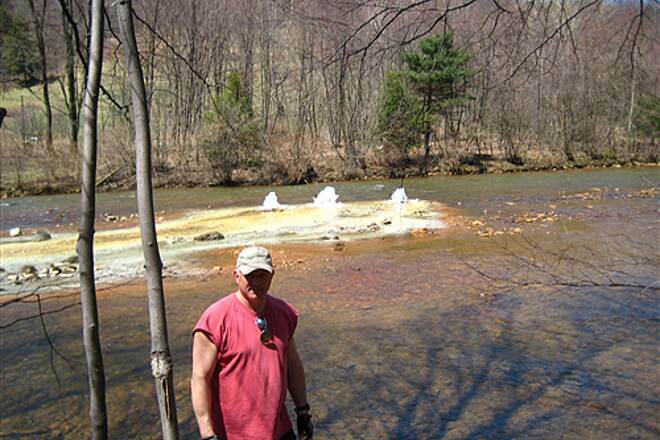 -Rich Ballash, Latrobe, PA.
1.5 miles east of the Heshbon Trailhead, on PA-259, we arrive at the 1903-post WW2 mining ghost town of Claghorn. Its 3 arch 1917 concrete bridge still connects the town side on the south side of Black Lick Creek to the railroad on the north side. 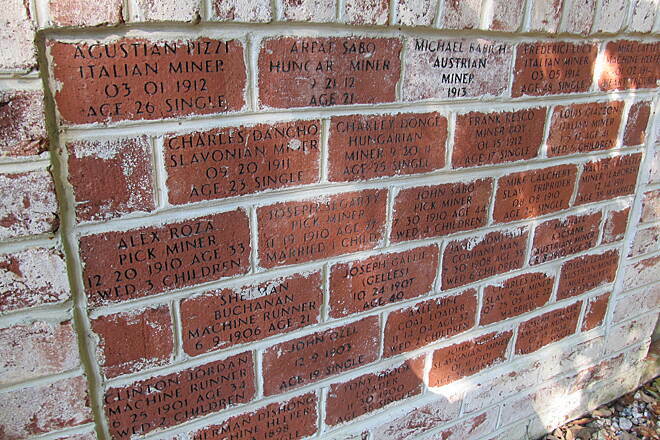 A very detailed historic plaque provides much information about this once substantial mining town. 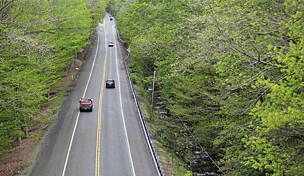 The PA-56 highway overpass is located at Trail Mile 9.7. Two railroad bridges were wiped out, I would guess in the Johnstown Flood of 1977, at the ends of the river loop between Trail MP 11.6 and 12.2. 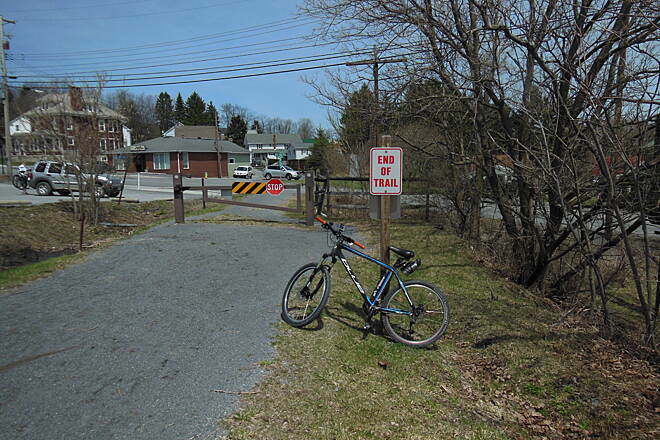 In 2009, two new pedestrian bridges were completed to close this trail section on this loop. At the west end, the single-span Scott Glenn Pedestrian Bridge was built on the two stone piers of ex-PRR Bridge 30.79 (Those PRR railroad mileage markers remain painted on both the east and west upper coarse pier stones). At the east end, a 3-span Armerford Pedestrian Bridge was built on additions to the tops of the four stone piers of the ex-Pennsy bridge. Both bridges are of 5-ton weight limit corten steel construction, very attractive spans. Between the two spans, this 1977 flood abandonment railroad segment was obviously the salvation of intact rusty classic PRR cast iron mile marker 31, one of very few of these survivors on this trail. 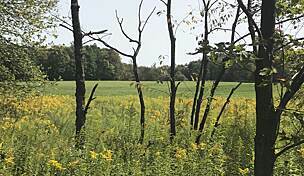 It is located at Trail Milepost 12.4, north side, as was customary on Pennsylvania Railroad lines systemwide. The other post flood survivor is located at Trail Milepost 12.4. The also rusty, point-topped cast iron whistlepost for the PA-271 Dilltown grade crossing survives in the "No stopping or Loitering 1500 foot" semi-private trail entry way into the Dilltown Trailhead, at Trail MP 12.4. A very unique, solar-powered, traffic-activated PA-271 trailhead crossing flasher guards the trail road crossing at Dilltown. 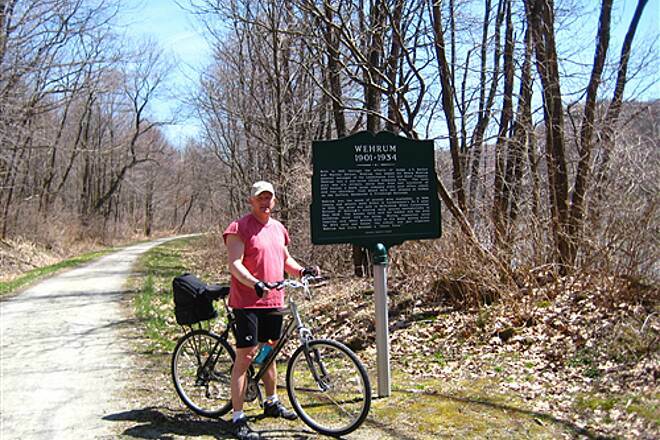 -Rich Ballash, Latrobe, PA.
We begin our ferroquinological tour of this trail at Milepost 0, adjacent to Saylor Park in Black Lick, PA. Extending from MP 0.2 at the east end of the thru-girder Black Lick Creek crossing, note the extensive half mile of railroad scrap, highlighted by the ex-Conrail (#CR472579 - Rebuilt 3-31-1988) gondolas, turned on their sides. The junction of the PRR coming up from Blairsville, and the old Buffalo, Rochester, & Pittsburgh (later B&O) coming down from Punxsatawney, is obvious at MP 0.5. From this point east, the BR&P used trackage rights over the PRR to get to its assets over at Vintondale, a "union railroad" of sorts. You can track this line around Saylor Park, from where I located classic BR&P Milepost 33, in my Hoodlebug Trail report. 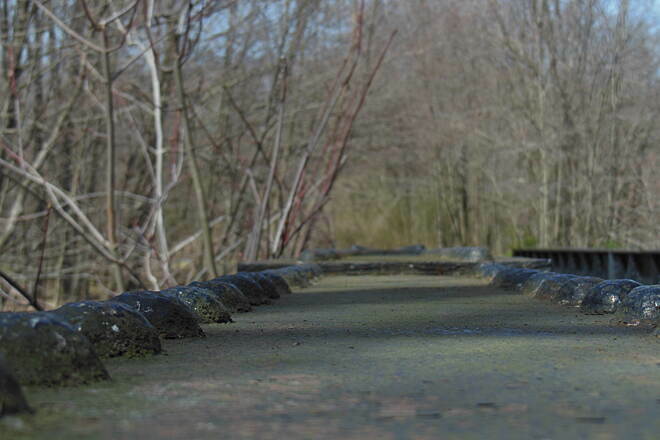 The line's girder bridge over Old Indiana Road is located just north of Saylor Park. At the junction, as near MP 33, the grade is barricaded off with a big pile of large railroad ties. Note the in-place lines of BR&P track ties at the junction. I was really excited by the wonderful historical plaque at the old Indiana County Street Railways concrete abutments at MP 0.8. Here was a 700-foot long steel bridge over the PRR/B&O and Black Lick Creek. Built in 1909, the span was part of the 1907-33 trolley system which connected Ernest, Clymer, and Blairsville to Indiana, PA (Also see my Hoodlebug reports for more of these artifacts). This thing was HIGH, and its southern end boasted a curved, wooden trestle to turn the track into today's TROLLEY LANE in Black Lick (DO go see that little street, too!) A photograph on the plaque shows the viaduct, which riders compared to riding on a roller coaster! Now that's COOL! Milepost 1 is the first of a splendid string of brand new Ghost Town Trail mile markers. Beautiful dark wood with a recessed-in metal depiction of a white ghost over a red bicycle... Very attractive! The westward direction marks mileages from Ebensburg. 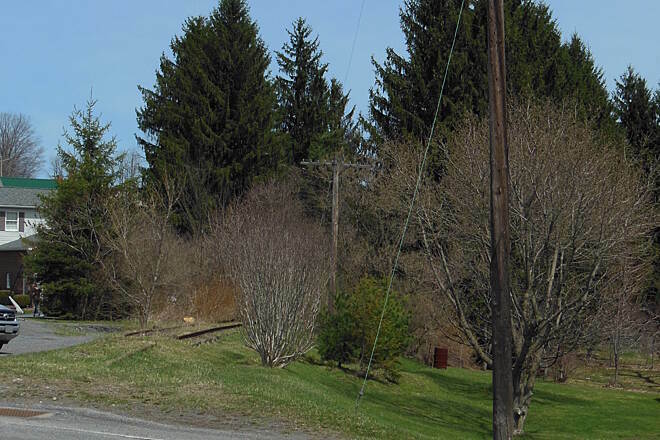 The last, but very significant railroad artifact is classic, cast iron Pennsylvania Railroad Mile Marker 37, which found salvation by hiding behind a tree on the north side of the trail, at Trail MP 5.7, 0.5 miles east of the Heshbon Trailhead. This rare survivor marked railroad mileage from Pennsy's little "EP" Block Station, at this line's eastern terminus, just north of Cresson. (PRR Marker 41 was still there, leaning over against the northern mudbank, when I first rode this trail in 2007, but it appears to be gone now) These classic white top / black bottom mileposts were ubiquitous to the PRR, at every milepoint, from New York City to Chicago and Saint Louis. One final note... This is a steady and stiff 6.5 mile climb from Black Lick to Heshbon, and was and still is quite an impressive and scenic whitewater following railroad course. -Rich Ballash, Latrobe, PA 3-11-2013. I grew up in the area and am really glad to see this now available. I've used it a few times when I come home for a visit and love it! I've ridden the whole length of this trail twice - both times as part of a tour that was an 800 mile loop beginning and ending at my house. About 450 of the 800 miles was on rail and canal trails, and the Ghost Town trail was as nice or nicer than any of the rest of the ride. The trail is very well maintained with a smooth surface suitable for a road bike for the whole length. There are many nice facilities (restrooms, pavilions, etc.) along the trail, as well as some very pretty scenery and interesting history. The Dillweed B&B and shop in Dilltown is a nice place to stop for refreshments. The only thing that would make this trail better is if there were a designated place to tent camp somewhere along it. I'm currently getting ready for my first century on Aug. 11th so I use this trail as a training place. Yesterday I took a vacation day as I wanted to get some good mileage in on the trail. I started at Dilltown headed to Blacklick and when I arrived at Saylor Park I was surprised to see signs for the Hoddlebug trail. I headed on to it useing the very well placed and huge signs that couldn't be missed. I peddled the trail to it's end at the Hoss's and headed back. I stopped at the Sheetz to refuel, which is right off the trail and at a great place at mile 26 if you hit it on the way back. After a 15 minute break here I started back to Dilltown and when I arrived back to my truck, my gps showed 47 miles. Another 15 minute break to refuel and as I sat under the pavillions two more bikers showed up as they were finishing their ride. We had a great conversation as they had done a couple centuries theirselves. People on this trail are always so friendly that I think Disney is wrong and this is the happiest place on earth. Back on the bike as I headed up to Ebensburgh wondering if I could do this whole trail today as it was in the 90s and very humid. Another great thing about the trails is alot of shade and it has to be 10 degrees cooler than road riding. I had planned to stop at Nanty Glo for a break but still feeling good I continued on. When I got to Ebensburgh I realized this section doesn't have much shade and it's a continuious slight uphill. Nothing hard but it's a nice workout, especially with 60 plus miles on your legs. Made it to the top and continued crossing the road so as to get to the very end of the trail. I wanted to be sure to have rode every bit of it. Starting back my water supply was low so wasn't sure where to refuel. This was my only mistake in planning this trip. I traveled back to where I crossed the road and noticed an Exxon sign to my left. Awesome, saved my whole trip as it was just a short way down the road where I refuled and took another break ( this one a little longer) before heading back. The trip back was a breeze because you get the down hill for about 12 miles of easy peddling. Passing the Y at the furnace I debated adding the Rexis branch but my time was running short as I had dinner plans with the wife and friends. I got back to Dilltown and total time was 7:10 and my gps showed 88 miles. Got to thinking I could get my 100 miler right here on this trail with no traffic and lots of great scenery and great people along the way. This is one fantastic trail and I highly recommend anyone to come here. Thank you so much to the great people who build and maintain these trails for all of us to enjoy and exercise safely. I, my wife, and two kids just biked a good portion of this trail this past weekend. We started in Dilltown where we stayed at the Dillweed Bed and Breakfast. On Saturday, we travelled from Dilltown towards Black Lick. It took us about 4-5 hours to do a roundtrip to Black Lick, and this included stopping for lunch. 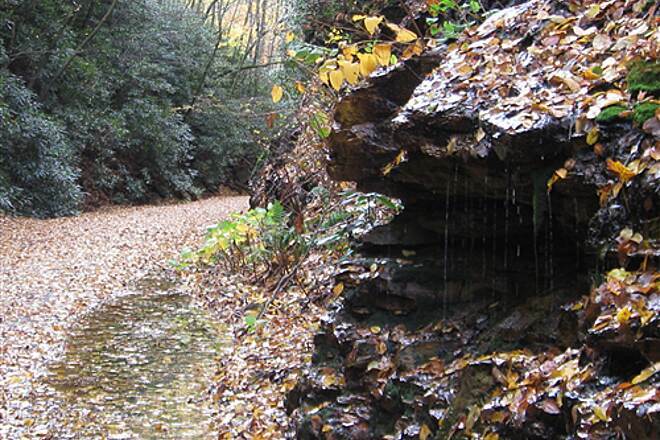 The trail follows the Black Lick Creek, and is very easy. The only problem we experienced was the slight grade on the way back to Dilltown. It was very slight, but noticeable. 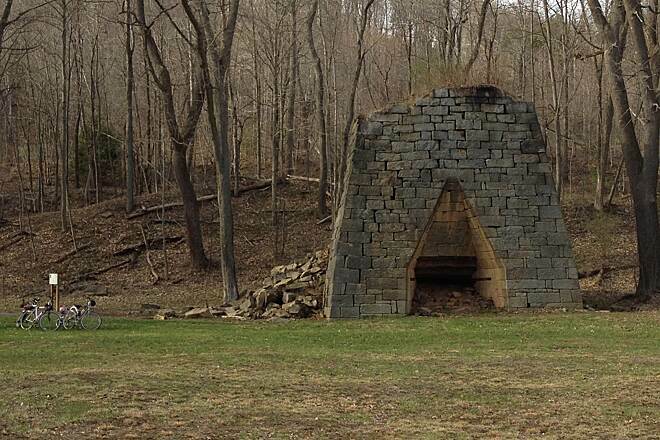 Along the way, there were remnants of the structures that were used for the railroad. 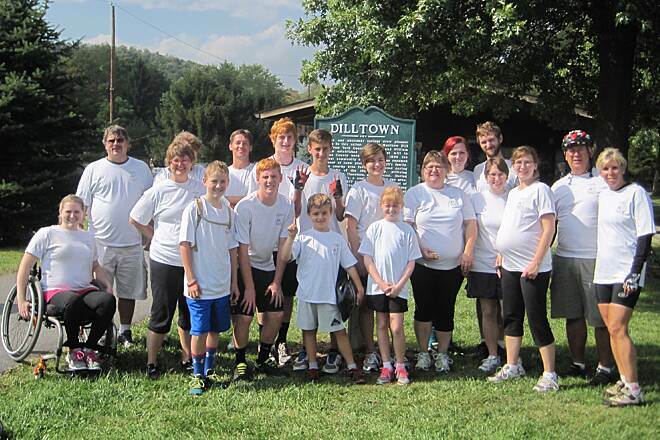 On Sunday, we travelled about 14 miles roundtrip from Dilltown to Vintondale. 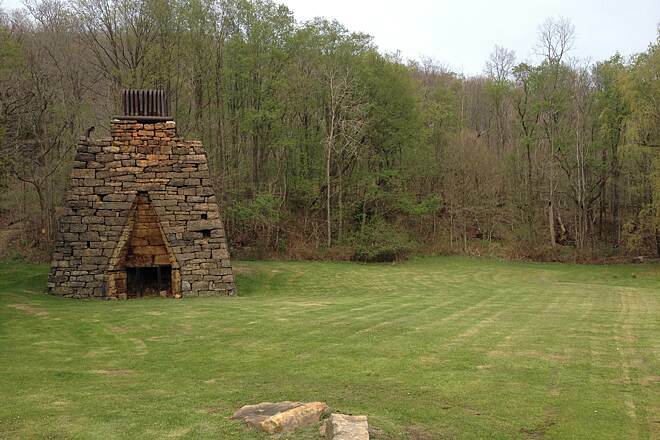 While my wife liked the Black Lick branch more, my kids enjoyed stopping in Vintondale to look at the Eliza Furnace and Vintondale Art Park. For the most part, this trail is shaded, which is a welcome relief from the sun and rain. For those wanting to stay on the trail, we highly recommend staying at the Dillweed. The family (and staff) that owns it was extremely friendly, the breakfast very hearty, and the accomodations spacious and very clean. Since there were four of us, we stayed in the Garden Suite, which is on the third floor. It has a large bathroom, double bed, twin, and a couch and TV with DVDs. It also has a kitchen. Even if you do not stay here, there is a small cafe and store. This was a great trip, and we can't wait to do more like this! GTT- A Trail to be Proud of! I biked 32miles of the Ghost Town Trail yesterday (did not ride the Rexis branch). 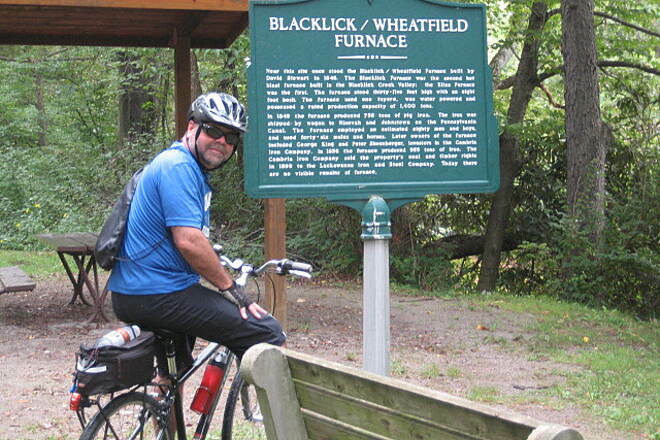 As my first long ride of the season, I decided to bike the (slightly downhill) Ebensburg to Blacklick direction. The trail is very well maintained and has plenty of signage to let you know exactly where you were along the trail. Bathrooms/water are available 3-5 spots along the trail. There were also many interesting historical plaques/informational signs. Be sure to take a camera because it is simply a beautiful trail. 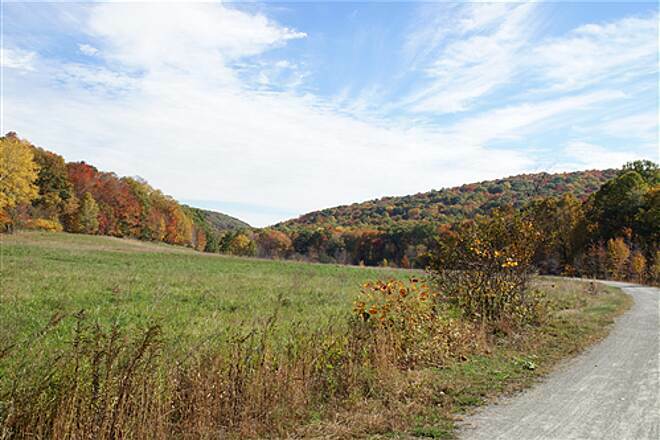 Expect to run into higher usage along the first 3miles near any of the major trailheads (Ebensburg, Nanty Glo, Vintondale, Dilltown, Saylor Park). Not to worry though as you ride thru, there are still plenty of opportunities to get a bit of one on one time with nature. As stated by others, I saw lots if wildlife on/near the trail and every person I met was beyond friendly! 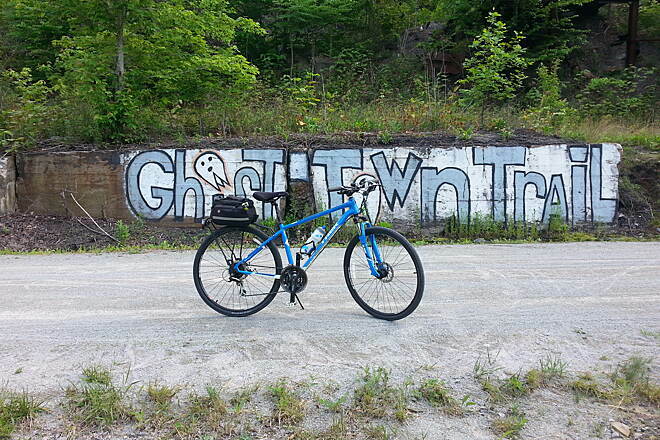 I highly reccomend the Ghost Town Trail to all riding levels and plan on biking it again many more times this summer! My wife & I rode the section between Dilltown & Nanty Glo as well as the Rexis Branch August 14th & August 16th. Even though it rained quite a bit on Monday, there was no standing water Tuesday. The trail was only a bit damp. 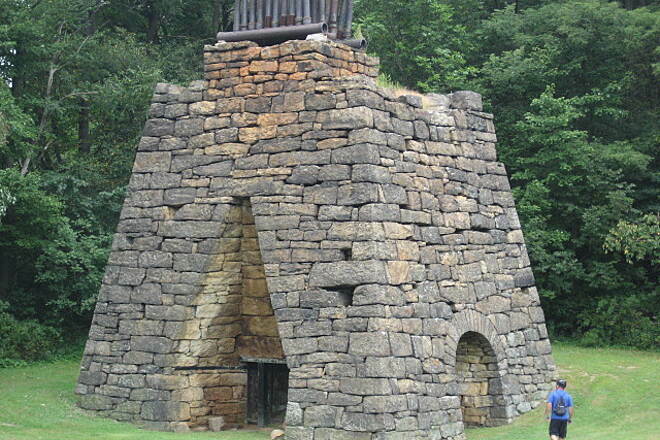 We especially enjoyed the furnace and mining exibits at Vintondale. We put the uphill at the beginning of our rides. It's not too steep, but it is a constant uphill grade. The ride down was a great relief. We stayed at the Dillweed B & B in Dilltown. This is probably the finest, cleanest place we've stayed at. The trail is next to their trailside store. We expect to go back next year to ride the rest of the trail. This is an amazing trail. 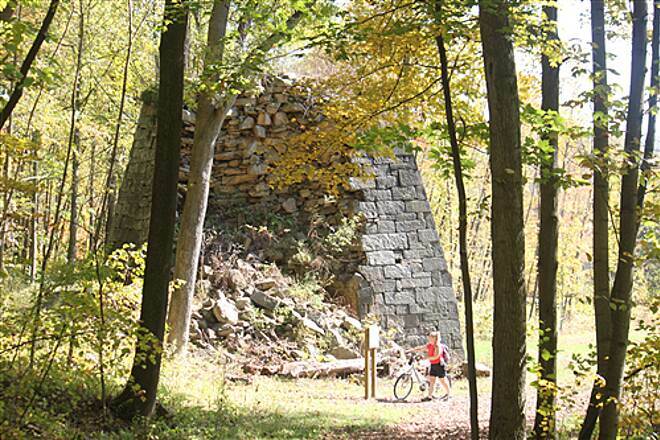 Like many trails in Pennsylvania and Maryland, it is rich with history. I would like to explain our previous experience for the sake of understanding how it fits in. We have been on the Great Allegheny Passage from the continental divide to Cumberland. For me, the unforgettable highlight was the the Big Savage tunnel, with its unending interior and its magnificent ending view. We have been on the York Trail, and I will not forget standing on the train platform where Abraham Lincoln awaited the train to Gettysburg. We have been to the Lehigh Gorge, where the trail is pure rich scenery, but the terminal town of Jim Thorpe is pure rich history. Unforgettable highlight?--the gallows where the Molly Maguires were hung, and the jail that contained them. These are all trips taken since my daughter was old enough to ride a trail-a-bike, in December 2009. Needless to say, I am just so happy that Rail-Trails exist, and create such great experiences. So what about our experience on this trail. 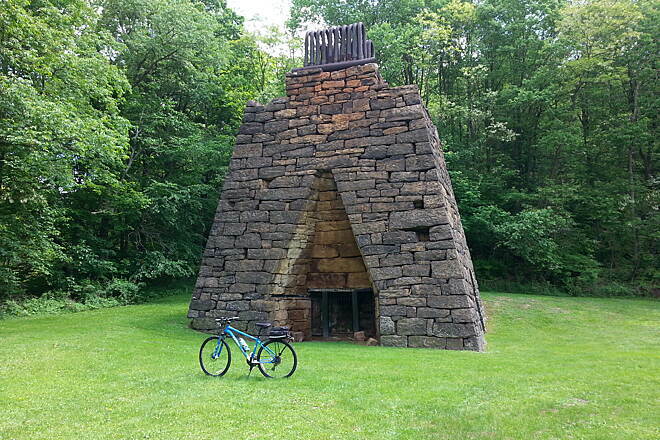 We rode the trail from Ebensburg to Saylor Park/Blacklick in the course of two July days of 16 miles each. The midway point is Wehrum. We were two families, with two five year olds tagging along, and so we could self shuttle, and make the trip entirely "downhill." I am very haunted by the things I saw, and think this trail must be extremely unique in the rail trail system. 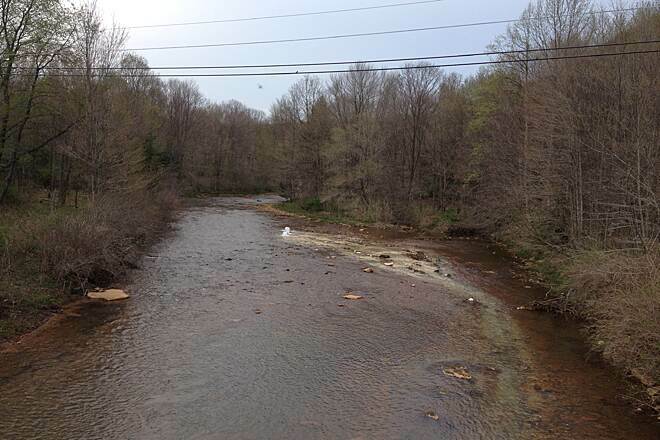 Just for example, one vivid memory is the sign that says that there are 300 different sources of coal mining pollution that are dumping into Blacklick Creek and its drainage. A biker will see plenty of slag heaps that leach poison into the stream. 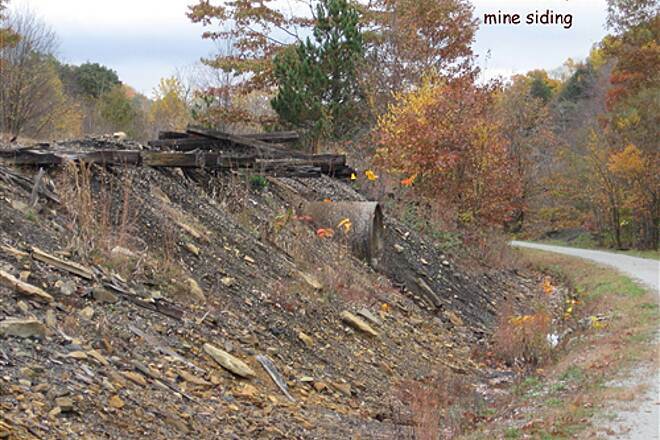 And will also see orange creek beds, with water coming from slag heaps out of sight. What is most stunning to me is that this damage is 100 years old, or so. The damage is not going away soon, folks. The whole trip could be a reminder to the consequences of not thinking about the world our children and grandchildren live in. Near the middle of the trail is Vintondale. This is a place where humanity and hope breathed deep and said, "We can start to undo this damage." There is a park there that is also an attempt to mitigate Acid Mine Drainage (it is referred to as AMD repeatedly, so remember this acronym). There are settling ponds, to get the iron red and the toxic aluminum out of the water. There are community fields for sport, and a pavilion. And a very quiet, very elegant memorial. 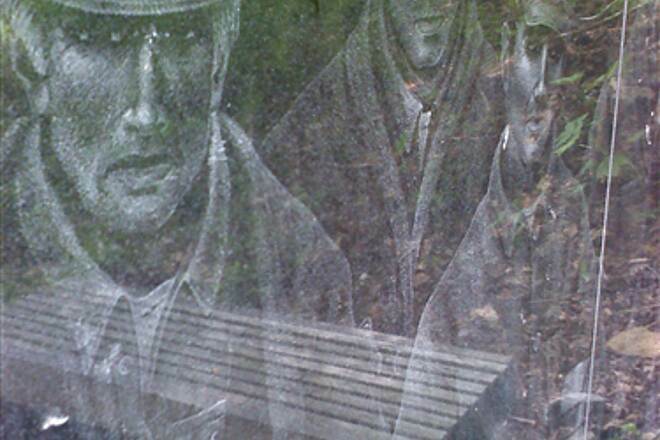 The first part of the memorial that you see is next to the trail. 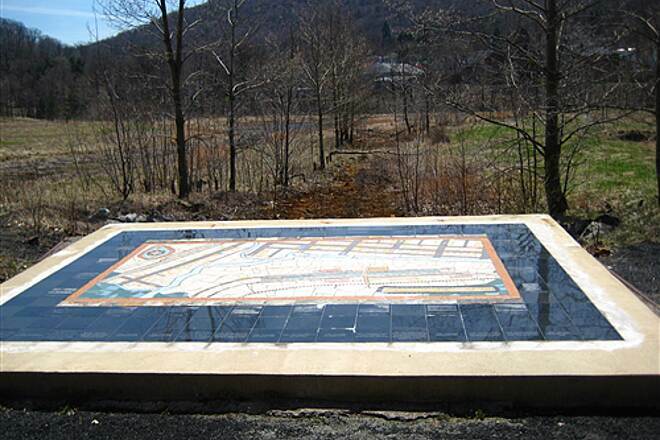 It is a large mosaic map showing how the scene before you looked in coal mining days. A busy place, with hundreds of workers instead of settling ponds. And then the most ghostly experience. 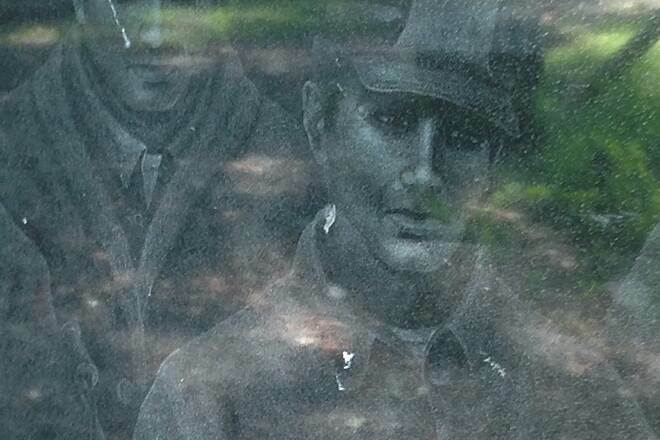 There is a mural, etched in black granite, of nine coal miners emerging from the mine shaft, placed against the canyon wall. We continued downstream. 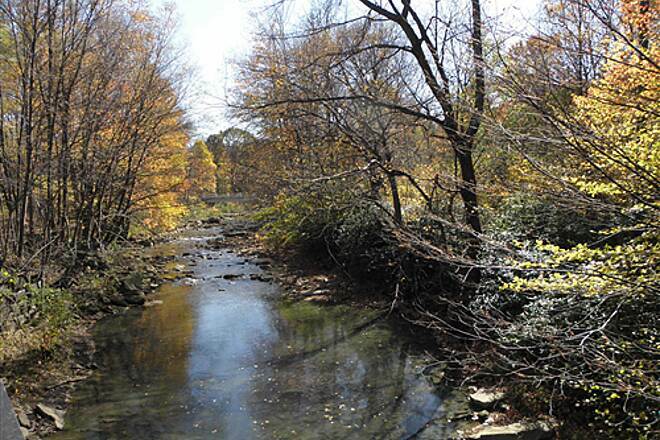 Right after Vintondale, Blacklick Creek turned a dark orange, and the clarity of the stream was lost for a while. I suspect that a major, polluted tributary had entered there. Beyond these stark reminders of our history, I think the highlights were the two iron furnaces along the way. I particularly liked the explanation of the furnace workings at Eliza Furnace. These from an earlier era than the coal mines, and the damage to the earth is less obvious. I hope I am not scaring people away from a truly outstanding rail-trail. For me, the big story were the lessons about the relation of man to the world. On the other hand, if you are not interested in this, the trail is very well maintained, and a joy unto itself. Other than the human scars, the stream is beautiful as it wends its way down into Blacklick. Rode this trail last weekend in two days. First day was from Heshbon to Vintondale the grade is almost flat and the scenery is awesome seen many deer and other small animals. The history along this trail is also great. 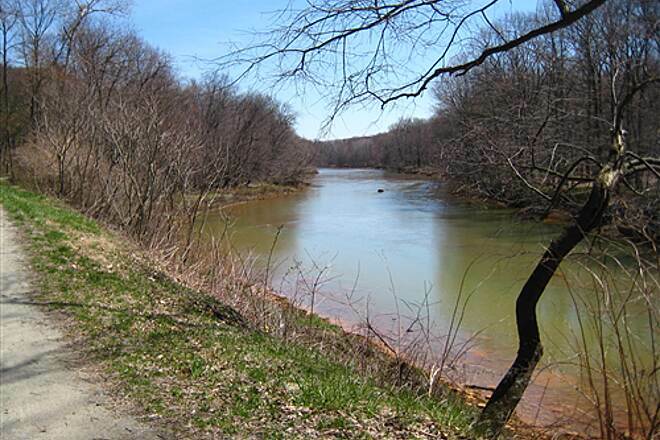 The second day we rode from Vintondale to about 2 miles past Nanty Glo at the bridge of the south fork of the Black lick creek. The second days ride was an up hill climb for 3.6 miles out of Vintondale to Twin Rocks then it seem to become more flat. The best part of the second day was the ride back down the mountain to Vintondale. This Trail has ample bathroom along it at trail heads and has alot of benches everywhere. 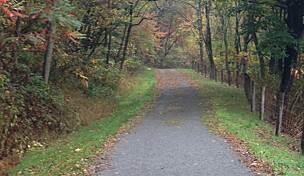 I would have to place this trail at the top of my to do list for a fall ride, but make sure you wear bright colors as it does go thru some PA state game lands. On last thing is don't forget your bug spray and camera. My wife and I rode a portion of the Ghost Town Trail (starting in Dilltown, going several miles in each direction) on May 13, 2011. The trail is in excellent condition, and we both had a great time. The Dillweed B&B has a cafe where we enjoyed a light lunch, as well. We look forward to returning to ride the entire trail! My husband and I rode this from Vintondale to Nanty-GLo Oct. 17th. The trail was great. We found the ride to be so peaceful and relaxing. Highly recommend this trail. 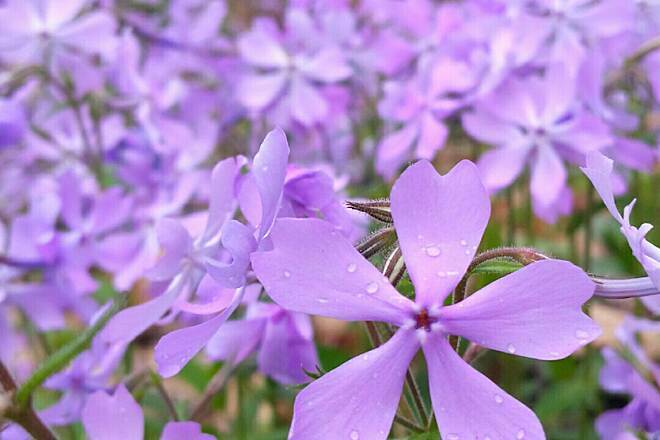 The weather was perfect and the colors were gorgous. We plan to ride more along the Ghost Town Trail in the future. My friend and I left his home in Ebensburg and rode to Vintondale over the weekend. We enjoyed the downhill grade pretty much the whole way to Vintondale. Very nicely constructed. Everything was well thought out. We stopped by the AMD & ART park and enjoyed what they have done so far. 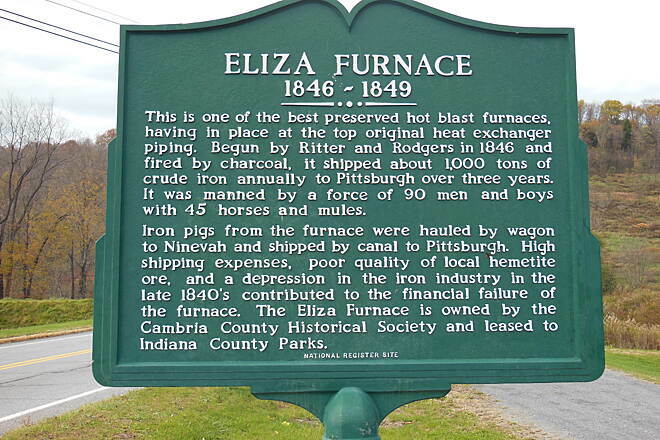 We also stopped by the Eliza Furnace which was very neat to see. 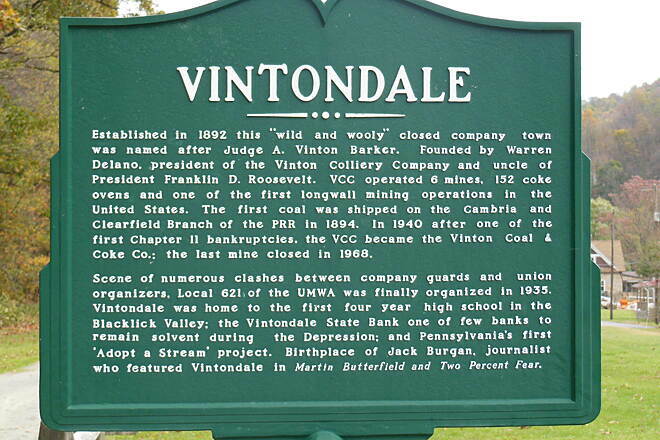 We plan on starting in Vintondale next time and checking out more of the trail. I highly recommend this trail to anyone! The climb back to Ebensburg was a good workout but not that bad. 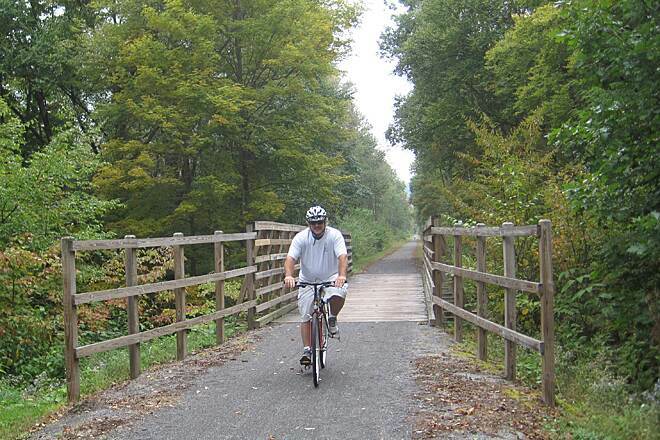 As of September 2009, the bridges have been installed in the Dilltown area which makes the trail complete between Ebensburg and Blacklick. This is a beautiful trail with everything one could want in a trail, including some rest area, restaurants in Nanty Glo, not to mention beautiful scenery. You'll pass all types of scenery and probably see some wildlife at some point. Pretty flat with some section of incline, most notably from Vintondale to Nanty Glo. 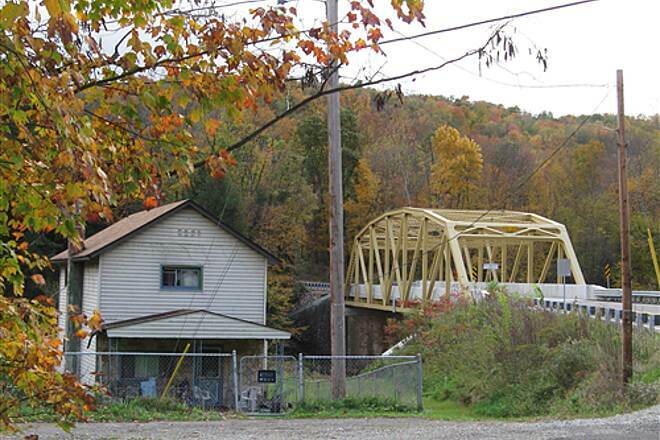 The project involved the installation of two pre-fabricated bridges at the Ghost Town Trail in Indiana County, PA.
Amerford Bridge is 224 feet in length and the Scott Glen Bridge is 125 feet in length. 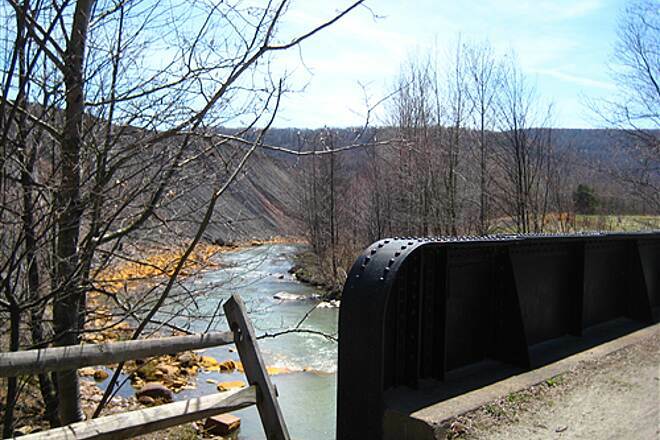 The bridges are named for two former mining towns once located along the trail. 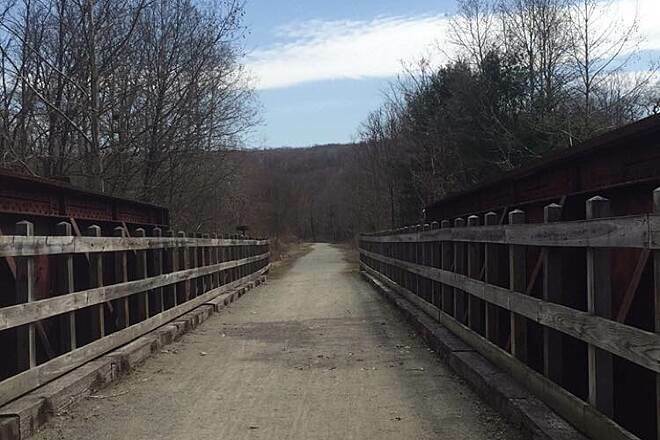 With the completion of the bridges and the construction of 6,000 feet of trail connecting them, trail users now have a continuous trail from Saylor Park (Black Lick, PA) to Ebensburg, a distance of 34 miles. 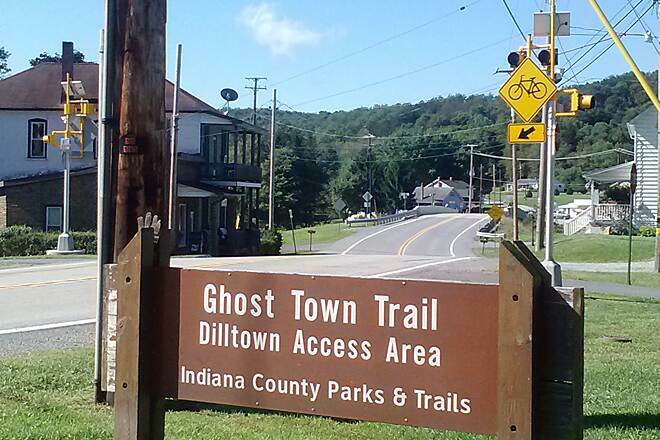 For more information about the Ghost Town Trail, visit Indiana County Parks & Trails (http://www.indianacountyparks.org/trails/gtt/gtt.html). 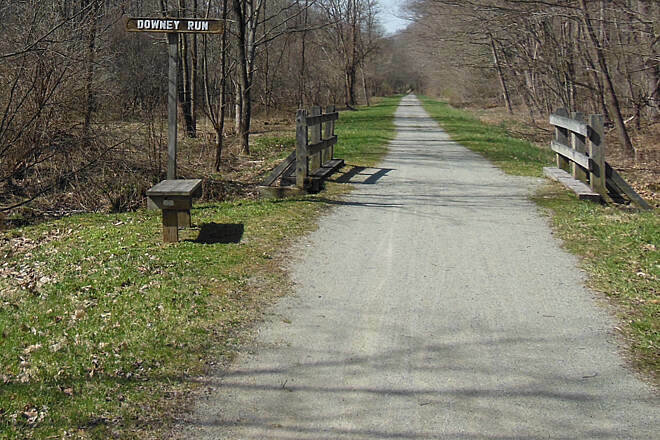 Funding for this project came from the PA DCNR, PennDOT, and the Rails-to-Trails Conservancy. Work on completion of the Ghost Town Trail missing link is nearing completion. Two bridges have recently been erected. Remaining work on the project includes construction of the bridge approaches, fencing and installation of 6,000 feet of trail surface. The expected project completion date is September 11, 2009. 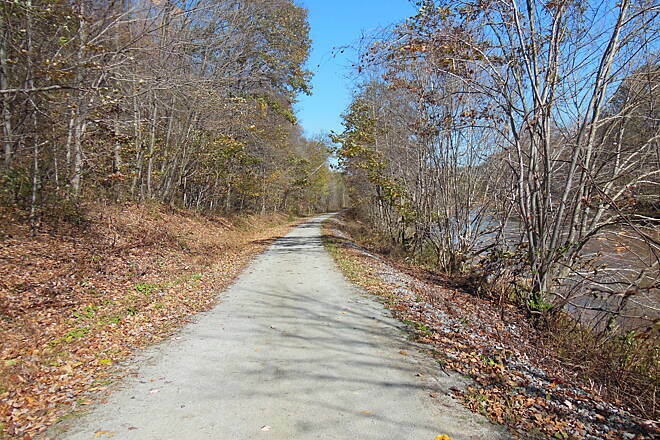 With the completion of this missing link the Ghost Town Trail will extend continuously for 34 miles from Black Lick (Saylor Park) to Ebensburg, PA.
Woohoo! The bridges west of Dilltown were just installed last week August 19-20. 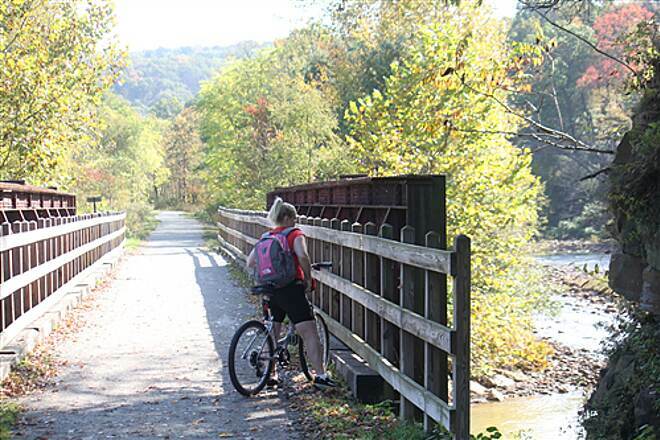 Indiana County Parks will be completing the work to refine the trail tread going up to the bridges. 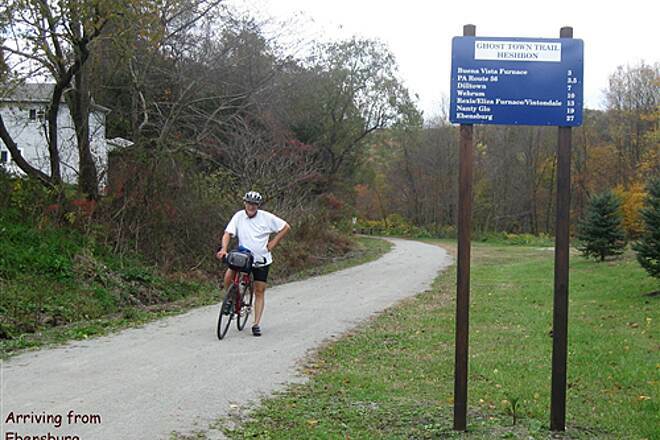 There is now completed trail the whole way from Saylor Park in Black Lick, PA 36 miles to Ebensburg. Way to go Indian County Parks! We are currently waiting for Echo Bridge Company to complete the manufacture of two pre-fabricated bridges for the Ghost Town Trail. At this time we do not have a definite delivery date for the bridges. Shawrose Construction will install the bridges once they are delivered to Dilltown. 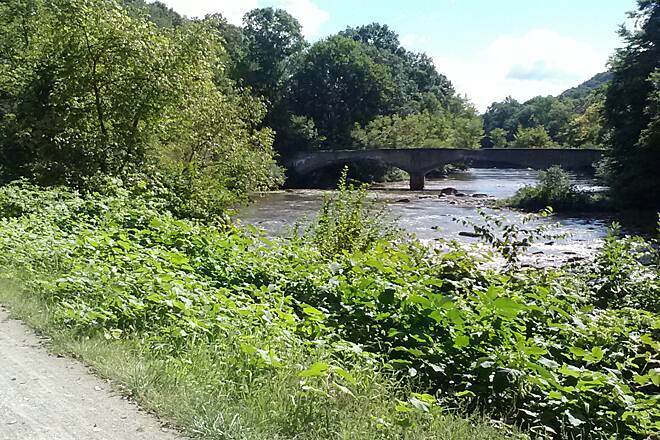 After the bridges are installed the trail surface to connect the two bridges will be completed by the Indiana County Parks & Trails maintenance staff. We appreciated your patience and support of this project. 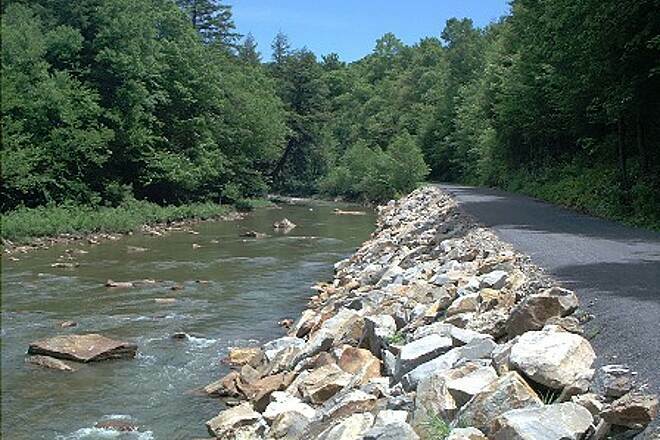 Shawrose Construction has completed all concrete work for the Ghost Town Trail Bridge Project located near Dilltown. We are now waiting for the two pre-fabricated pedestrian bridges to be manufactured. Delivery of the bridges is not expected until the end of the year. The completion of the bridge project will depend on the delivery of the bridges, weather conditions and the contractor's work schedule. A spring 2009 completion is anticipated. "Did a Labor Day weekend trip on the Ghost Town Trail yesterday, and it was a very nice ride. We parked at the Dilltown parking lot, which was nice with a big field for the kids to run around in, covered picnic pavillion, and public bathrooms. We went East from there to the Rexis/Vintonville Split at around 5 miles. There's a parking lot at the split. This first part of the trail was very flat and follows the Black Lick Creek, and there were some nice historical markers and a few places where the trees were cut back to provide a view of the creek. The piles of mine waste along the North side of the trail, while historically significant, were sort of ugly, if you ask me. The section from the split northward to Red Mill (2.4 miles according to the sign at the split) was gently uphill the whole way. Probably a 1-2% grade. It was mostly through wooded areas, but passed a few homes to the West. We arrived at Red Mill, which had a nice historical marker about the grist mill that is no longer there. There's an old bridge that's worth seeing there, and a rental cabin about 500m from the trail that looked like it's be a nice place to spend the weekend with friends. The trail continued on Northward from Red Mill, but there was a pile of crushed limestone in the middle of the trail and it looked like that part wasn't as well maintained. We had left a car at the small parking lot in Red Mill (no facilities) and headed back to Dilltown. The whole ride took about an hour and a half. To end the day on a high note, we drove 15 minutes south on 403 into Johnstown, took the inclined plane up the mountain and had a nice dinner overlooking the city at City View Bar and Grill. It was good- we sat outside on the balcony." "Excellent trail conditions. Crushed stone was smooth and hard packed making it easy to ride. Stayed at the Dillweed B&B in Dilltown. This was the perfect place to stay and the owner Cindy was a wealth of information. The first day I rode from Dilltown to Ebensburg and on the return also covered the Rexis branch. It ends abruptly near Hwy 422. Hope they take it farther. Had lunch while on the ride at the Niner Diner in Nanty Glo. Dinner later that night was at the Griffith Tavern as nearest town is 10 miles away. Lots of riders on the trail. Mile markers were in placeand at several places there were nice bathroom facilities. Slight incline going toward Ebensburg made the return trip quicker. The next day had some rain forecast so I decided to drive to the Heshbon access and ride a figure eight. Brige connecting the trail at Dilltown still not done. This part of the trail lacked mile markers. Condition was excellent though. Few riders on this section. At Sawyer Park in Blacklick I came across another rider who was heading toward Heshbon so I rode with him and discovered that he rides the 24 miles almost daily. 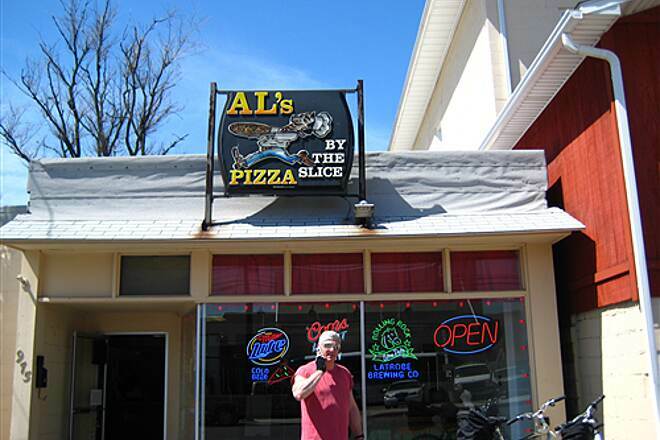 He recommended Al's Pizza in Nanty Glo for dinner and said to not miss the Coconut cream homemade pie. 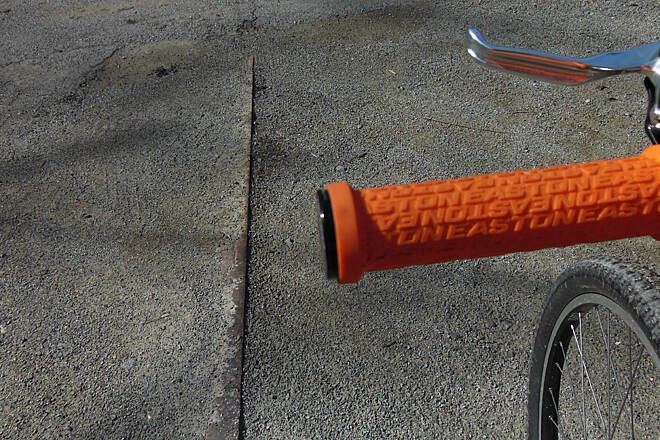 Those are the tips that make a ride extra special. He was right on as dinner was great The owner came out and talked with my wife and I too. Brought us some pegash (perogi's) to sample. We enjoyed our stay so much that we're planning a return trip some day. 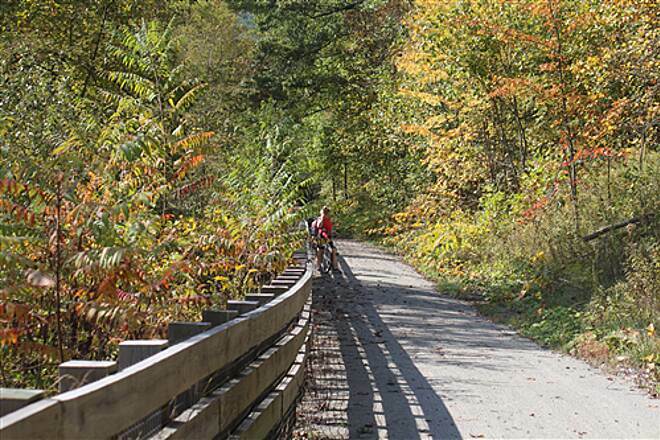 This is in the top 5 Rail Trails I've ever ridden taking into account trail condition, scenery, lodging, and facilities." 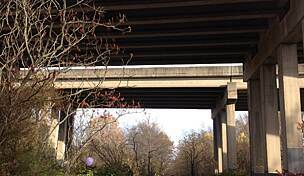 Funding for the installation of two major bridges has been approved. Once completed the two bridges will provide the final missing link in the GT Trail regional trail system. Engineering of the bridges has begun and pending the receipt of suitable bids construction of the bridges will occur in the summer or fall of 2007. Your patience is appreciated. 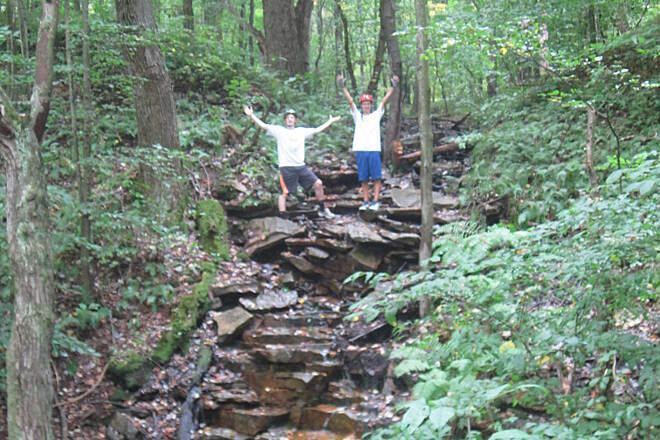 Vist our website www.indianacountyparks.org for additional trail updates. 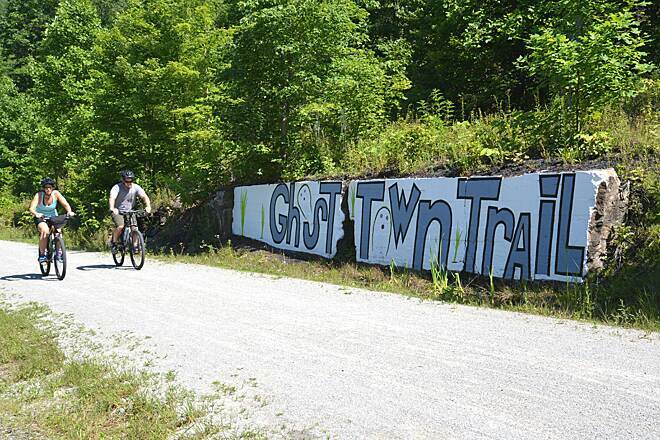 "As metioned in previous reviews, the Ghost Town Trail has been extended from Nanty Glo to Ebensburg in Cambria County and from Saylor Park near Blacklick to within 2 miles of Dilltown in Indiana County. 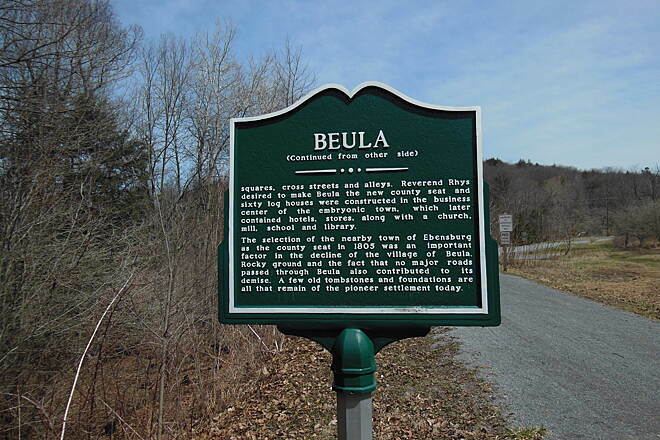 On the Ebensburg to Nanty Glo section, historical markers are located at Ebensburg, Beula and Nanty Glo. The grade from Nanty Glo to Ebensburg is .7%. 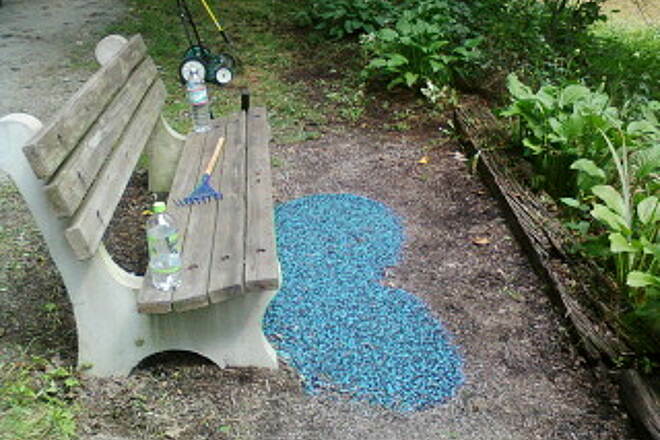 Several benches are located along the new section, with construction of small pavilions still waiting for sponsors. 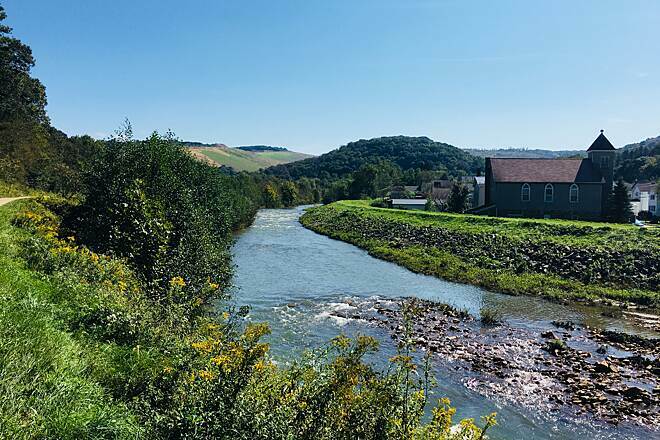 For the new colored brochure of the entire trail plus the Hoodlebug and West Penn Trails please call the Cambria County Conservation & Recreation Authority at 814-472-2110 or email at jbartock@co.cambria.pa.us "
I highly recommend this trail. It is well kept and very informative. I found the Rexis Branch the most scenic. "Ebensburg-Nanty Glo, and Heshbon section"
"The new section of the trail from Ebensburg to Nanty Glo was opened in the Fall of 2005, along with the section from Black Lick heading East towards Dilltown. 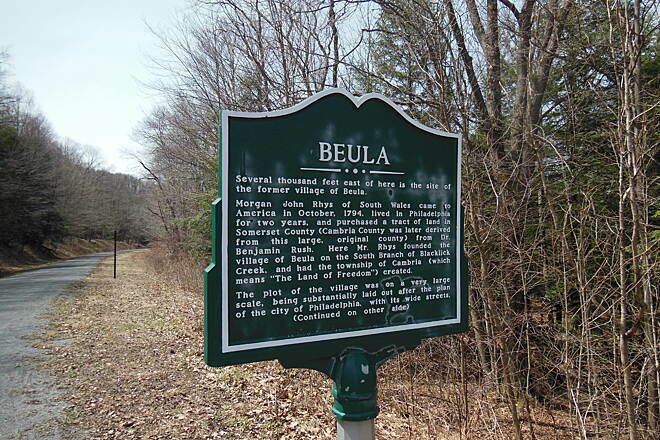 Both new sections are very nicely done, especially the section between Ebensburg and Nanty Glo...they put up mileage markers on this section along with an historical sign about the town of Beulah at the Beulah Road bridge about 3 miles West of Ebensburg. These new sections are slightly different from the ""older"" section between Nanty Glo and Dilltown, in that the trailbed is slightly higher than the ground around it due to it's resting on the elevated railroad bed. This gives more of a feel of riding on a railroad line than just a path through the woods. 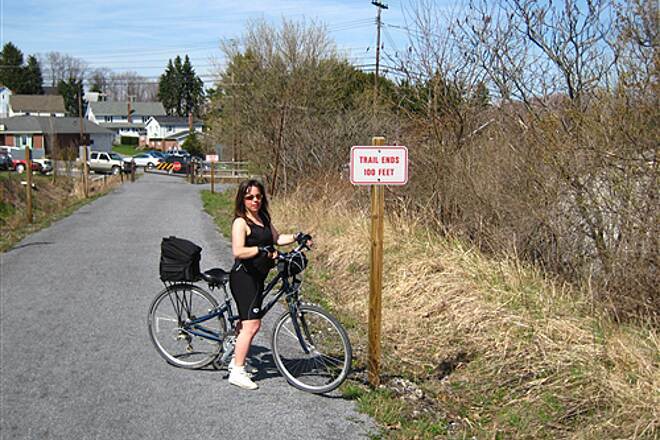 The trail now is a total of 19.5 miles from It's Easternmost end in Ebensburg to the Dilltown trailhead. 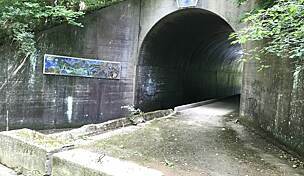 The trail from Ebensburg West to Nanty Glo passes the Ebensburg ballfields, goes under a road bridge in Ebensburg, and under the Route 219 bridge at the ""Y"" junction where the CandI trail intersection is, also over bridges at Beulah Road and Blacklick Creek, and finally past a swampy area just East of Nanty Glo. Just across this swamp/wetlands is where the CandI trail will come into Nanty Glo from the East. 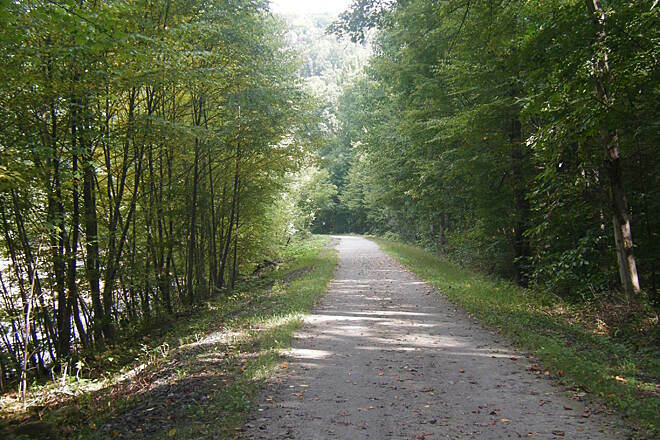 This section of the trail between Ebensburg and Nanty Glo is very popular on weekends, and and also with people out biking, walking, and jogging after work in the evenings. The new section from Black Lick heading East towards Dilltown gets used less than the rest of the Ghost Town Trail due partly to it's remoteness, but that will probably change once they finish it with the bridges to link it with Dilltown. This section of the trail has a more rugged feel to the countryside with the trail passing old mining sites, going through several rock cuts the railroad made between the hillside and the river, and through remote wooded areas. Things to see on this section of the trail are mining sites both East and West of Heshbon, a large silo-type building near the Route 56 bridge, the Buena Vista Furnace just off the trail,""the bridge to nowhere"" an old concrete 3-span bridge that crosses the river about 2 miles East of Heshbon, several small bridges crossing the streams under the trail including one just West of Heshbon with acid mine drainage running in the stream, lots of views of the acid mine polluted orange colored Blacklick Creek with some nice overlook-type views, and an old concrete bridge pier in the middle of the creek just East of Black Lick. 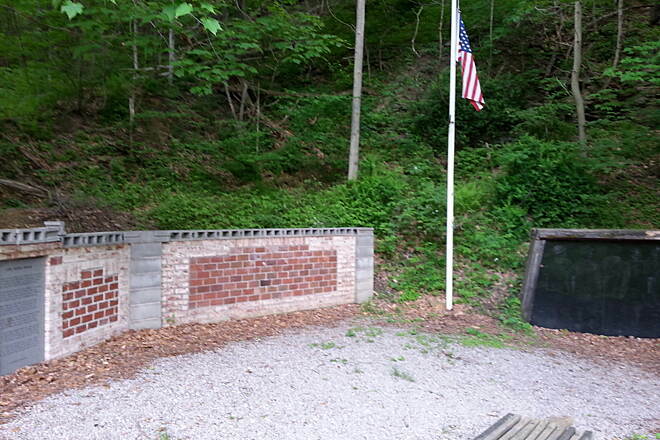 The trail ends at it's Western end at the community park in the town of Black Lick. Here there is a park restroom facility, picnic pavillion and basketball court. Also, there is a view of the smokestacks and nuclear-style cooling towers of the nearby Homer City Generating Station. From this park they will be linking the Ghost Town with the Hoodlebug trail; as of now (July 2006) the link isn't finished. 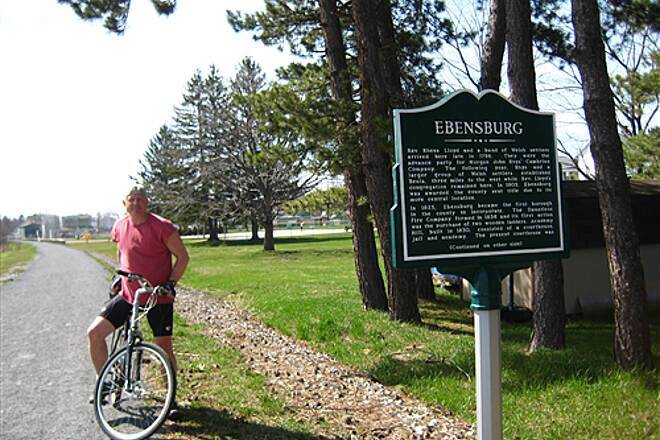 The Ghost Town Trail rises in elevation going from West to East, so Ebensburg is the highest point on the trail. The section between Vintondale to Nanty Glo is the steepest with the grade being probably around 1 1/2-2%, and the rest of the trail being either nearly level to 1% grade. 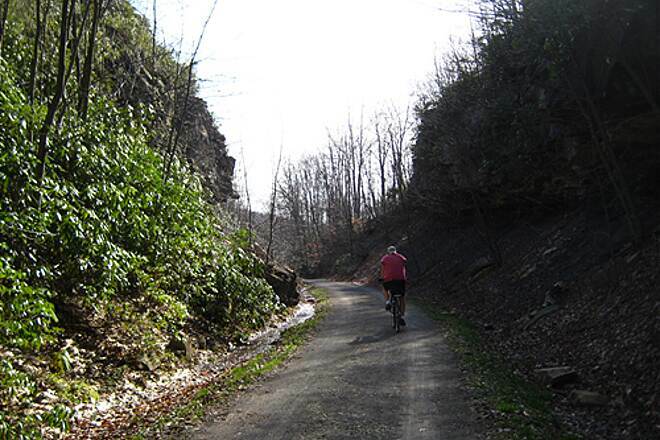 The most used sections of the trail are Dilltown to Vintondale, and Nanty Glo to Ebensburg. There are ""No horses allowed"" signs up along the entire trail, as of 2006." 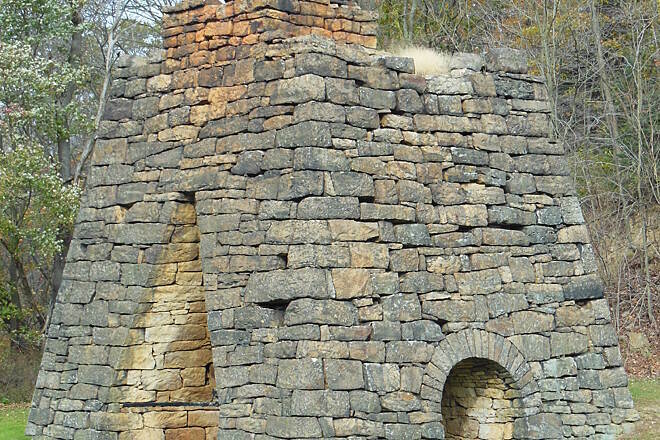 Also a new full-color guide to the Ghost Town, Hoodlebug and West Penn Trails has recently been published. 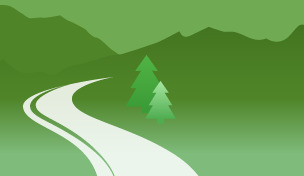 Send e-mail with your mailing address to indparks@earthlink.net to obtain a guide via regular mail. The guide will also be posted on our website in the near future: www.indianacountyparks.org"
"The trail has been enhanced to include the AMD & Art project in Vintondale, the Rexis section toward Rt 422 (Candi Trail) has been restored to full width again and the sandstone quarry building has had another room added for the public to view." "We did the complete trail up and back in 1 1/2 days. Vintondale to Nanty Glo was quite a workout, but refreshments at the end of the line was great. Dilltown was having their herb festival, lots of people and crafts. The trail is great; we only wish the trees between the trail and the creek were trimmed in some places to get a better view. 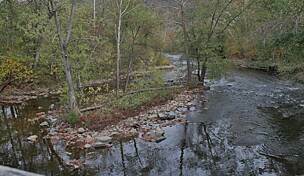 Don't miss the cutoff to Rexis, to the end past Red Mill Bridge." 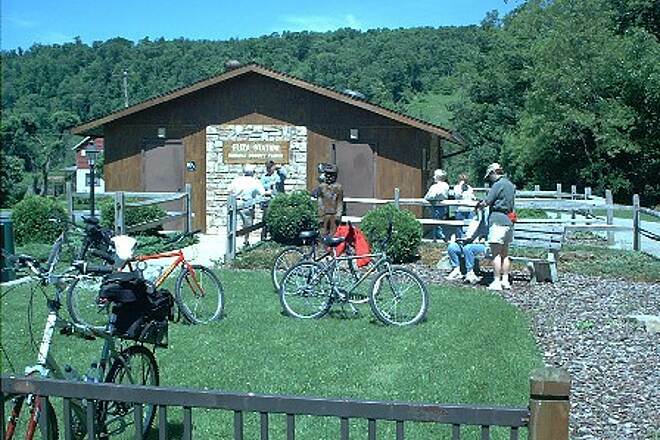 "While riding the Ghost Town Trail last week on June 25, 2003, I was pleasantly suprised at the beauty of the trail and Blacklick Creek, and I was very impressed with the trailhead in Dilltown. Here there was a large parking lot, picnic pavilion and rest rooms. Along the beautiful trail there are many educational signs explaining the history of the trail and how the DNR is cleaning up the wetland area around the mines and protecting the enviroment from acid mine drainage into the streams. The climb from Vintondale to Nanty Glo is a good workout." 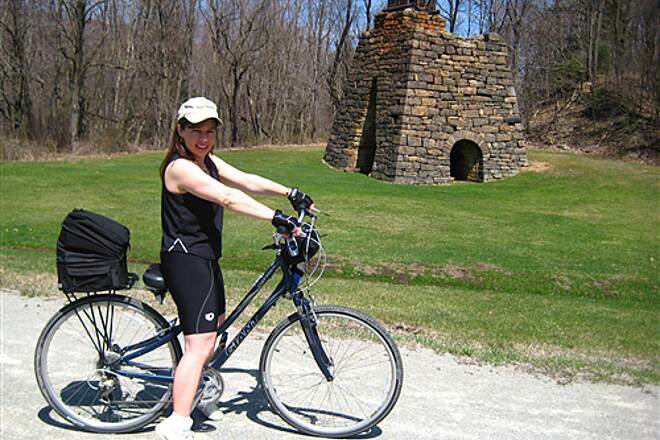 "Ghost Town Trail is one that I've ridden many times and as a Rail trail it's really nice, the local scenery makes it very unusual though. The trail itself is in very nice condition, with trailhead parking in Nanty Glo and Dilltown, and restroom facilities in Vintondale. 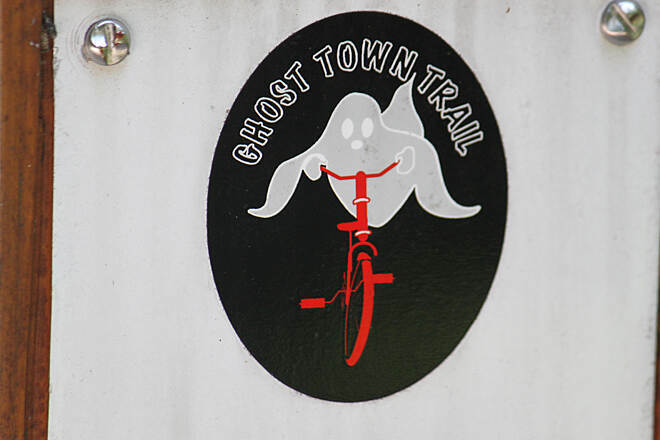 There is a nice picnic pavillion and a trailside store in Dilltown that sells refreshments and other merchandise (got myself a ""Ghost Town Trail"" T-shirt there with a ghost riding a bike on it!). The trail has an uphill grade to it between Vintondale and Nanty Glo which is a little more than most of the rail trails I've been on. 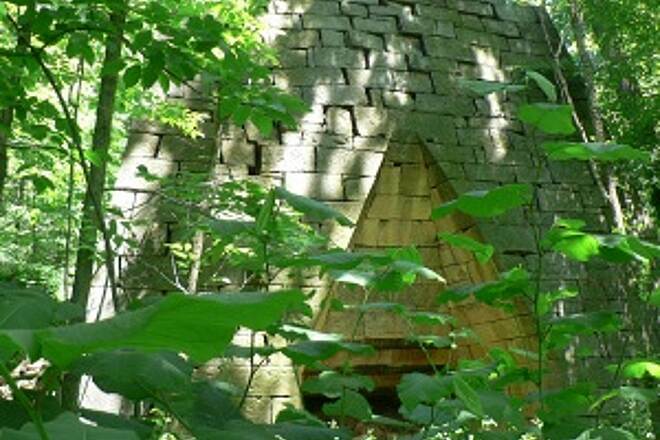 The most unusual thing about the Ghost Town Trail is the type of scenery it passes through. 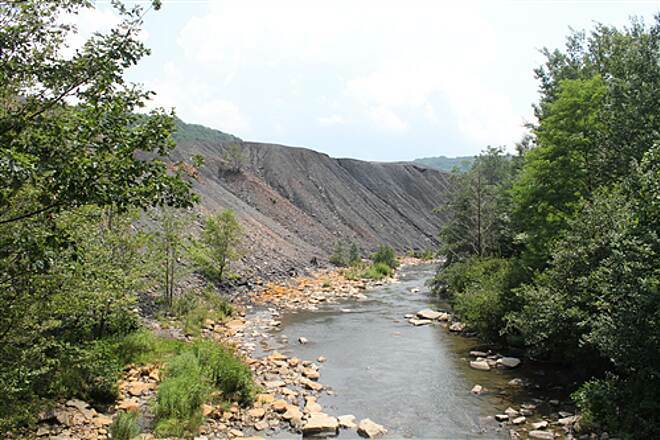 There are many areas along the trail where they mine for coal and left behind reminders of this regions ""Coal Country"" history. There are several large areas of mine tailings dumps along the trail where there is no vegetation, just black mounds of mine waste. Nanty Glo has two large areas of coal mine waste dumps around the town, and the one looks like the aftermath of the Mount Saint Helens explosions with everything black, and the trees dead and pale grey. I took photos of this area for a college photography class, and one of the other students thought my photos were of the volcanic national parks in Hawaii because they both look similar. 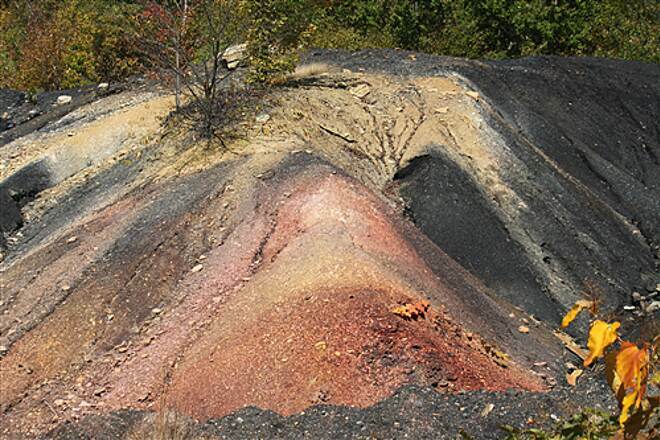 There is also a large mine tailings dump in Vintondale that looks like the Black Hills region in the Dakotas, because it is a large black sweeping hill with colored striations running though it. There is also a smaller dump just west of Vintondale that is also black, but it has yellow and white crusty streaks coming out of it and smells of sulphur in the summertime (smells like Hell ?). 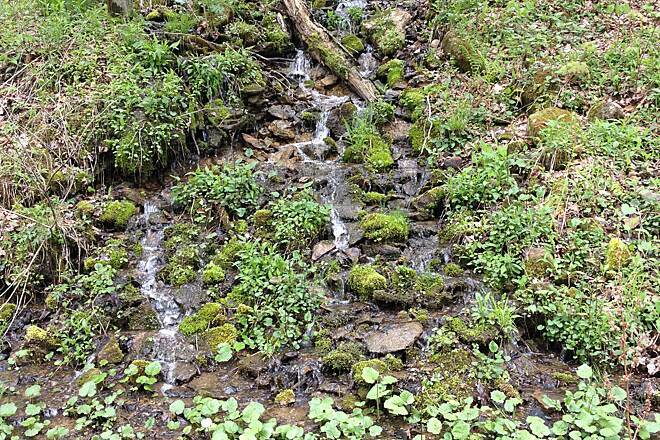 The stream along the trail is unusual too because the stream has been polluted by acid mine drainage and all the streambed and rocks around it are orange, instead of their ""normal"" color. The view of the orange stream and black hill from the bridge just east of Vintondale is interesting. Climb to the top of the mound of tailings in Vintondale and you'll have a good view of the town and the trail going through the valley. Near Twin Rocks there is a cut in the hill that the trail goes through that exposes a coal seam on both sides of the trail, with lumps of coal laying around the trailsides. It's perfect for picking out Christmas presents for those kids on Santa's ""naughty"" list." "Parking also available in Twin Rocks, Red Mill, & White Mill areas. 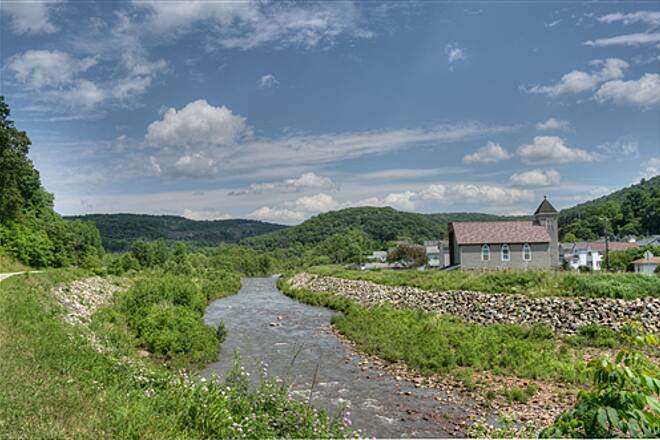 Historical sites also include sandstone quarry remains from 1923, millrace from Red Mill grist mill built in 1828 and a still operational trestle bridge built in 1890." 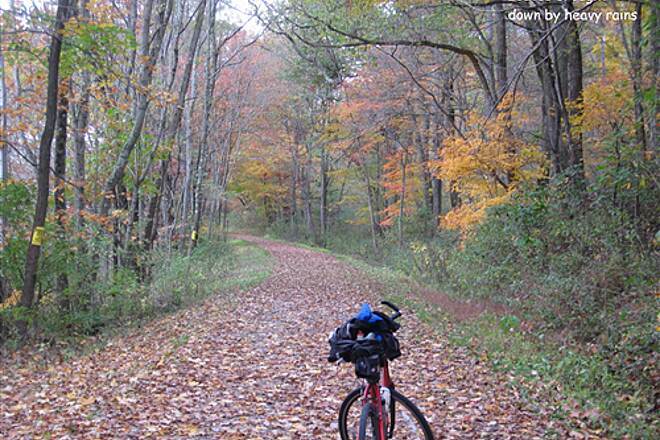 "This trail is great for solo riders or whole families. 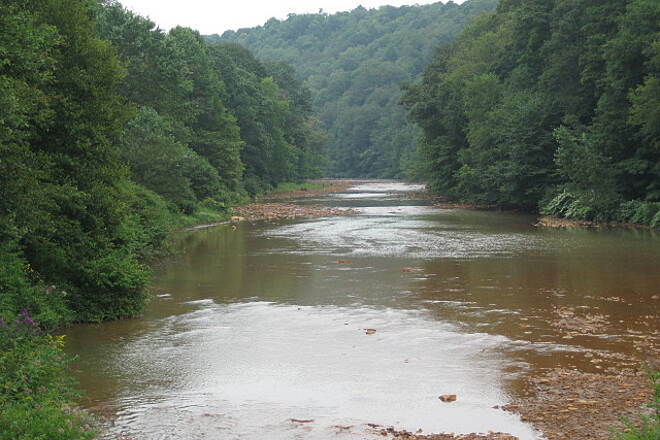 It passes historical sites and thru PA gamelands with some great trout streams. Only two places to overnight-Dillweed B&B and Red Mill Cottage. Overnight camping is only allowed in the Rexis Area at the House of the Rising Sun hospitality house, free of charge."